It is not everyday that your best friend ties the knot. 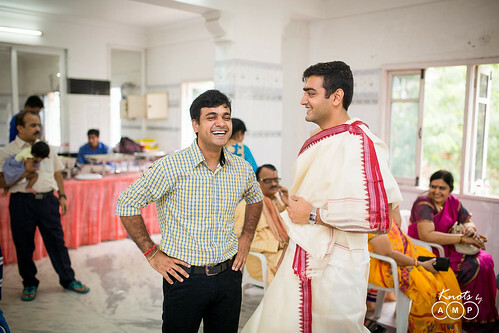 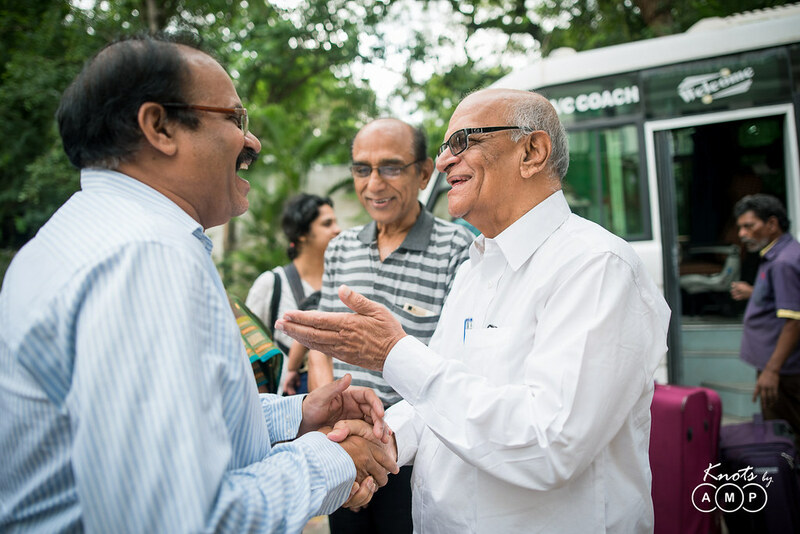 Aditya and I have been inseparable friends since school times. 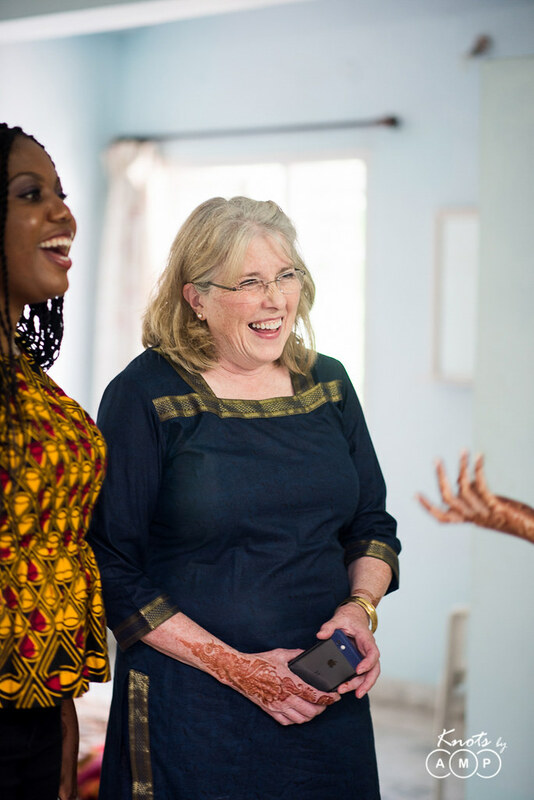 So when you receive the news of your best friend getting married it brings many thoughts, it makes you nostalgic of all the good times spend together and how time flew that your friend is about to reach an important milestone in life. 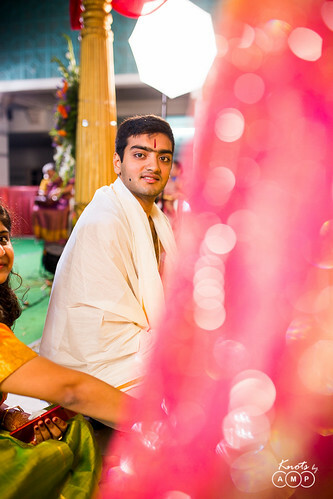 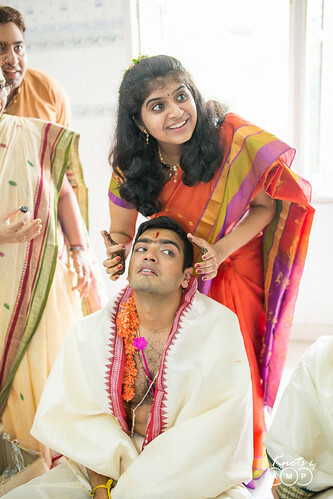 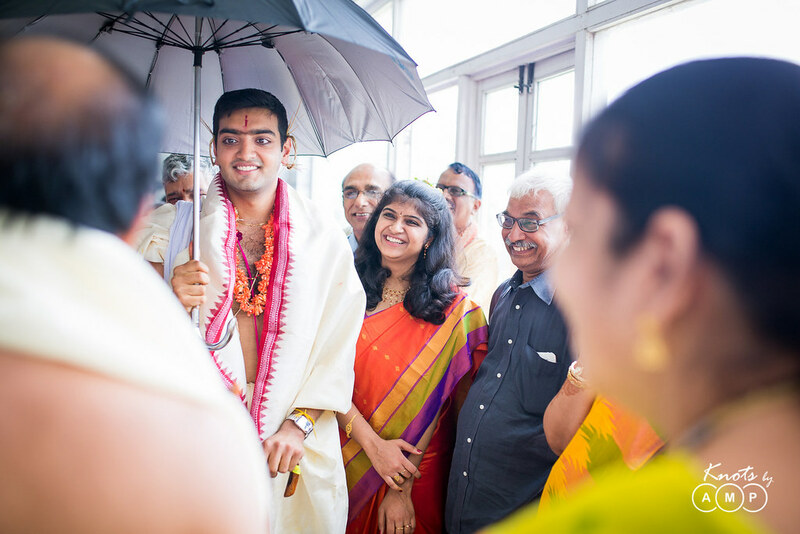 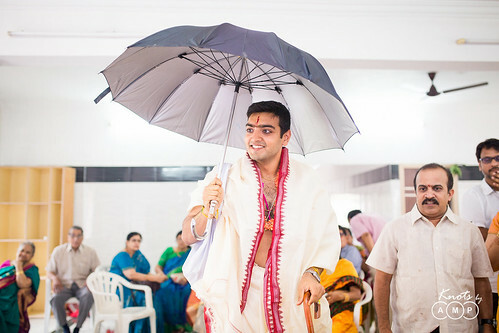 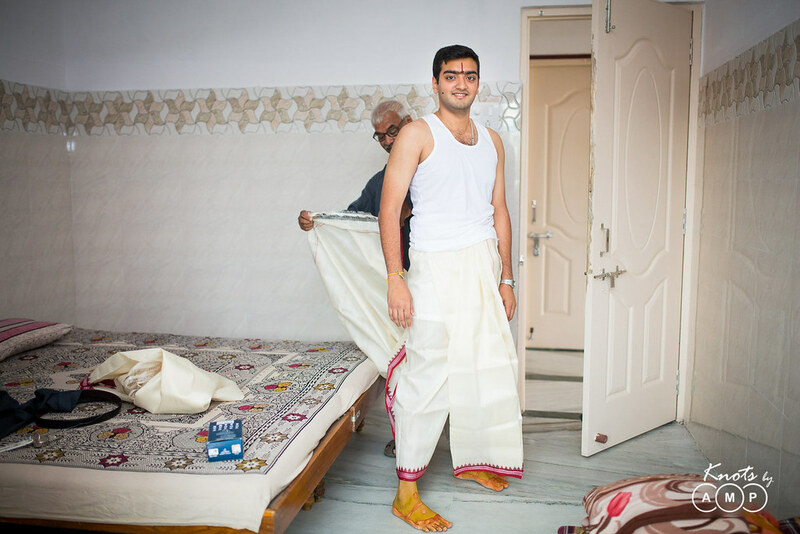 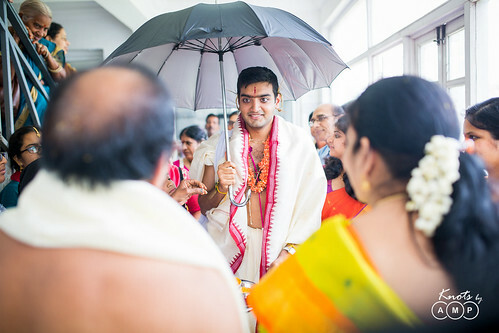 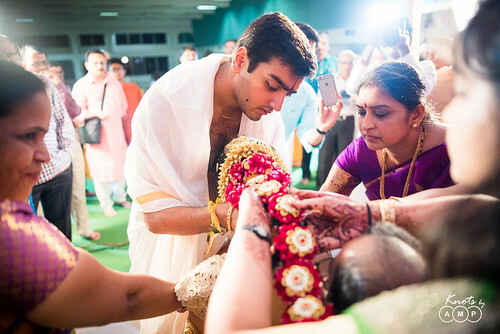 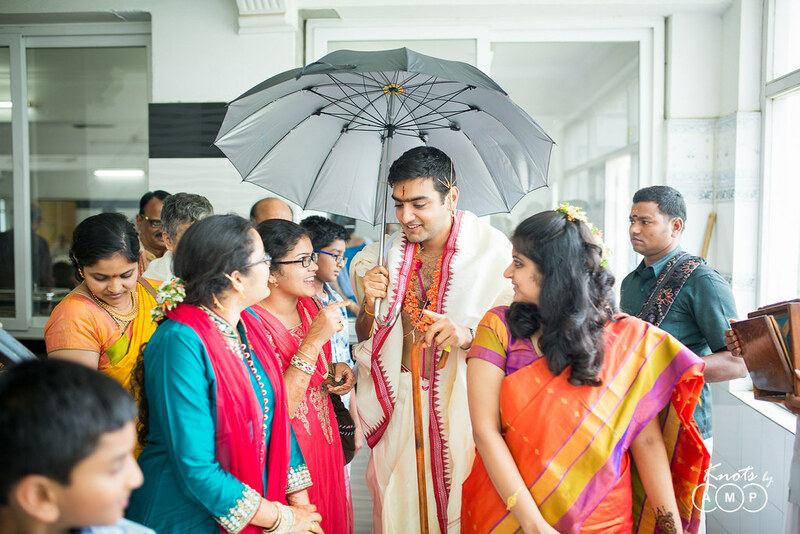 So, Aditya was all set to marry the tall and pretty Sahiti. 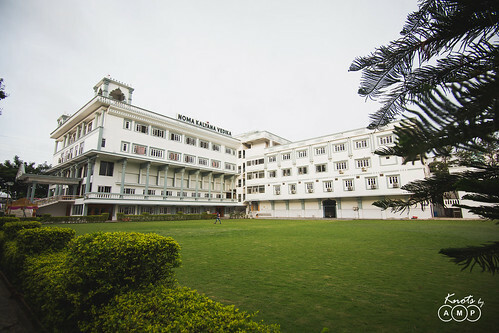 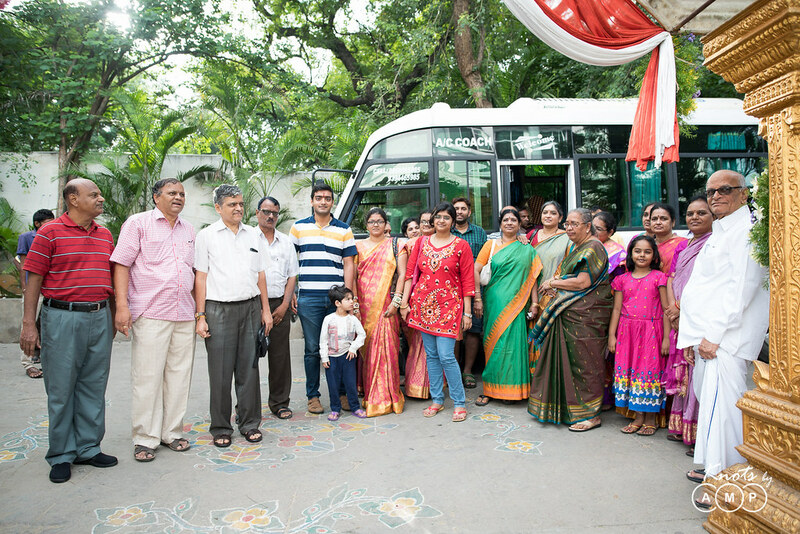 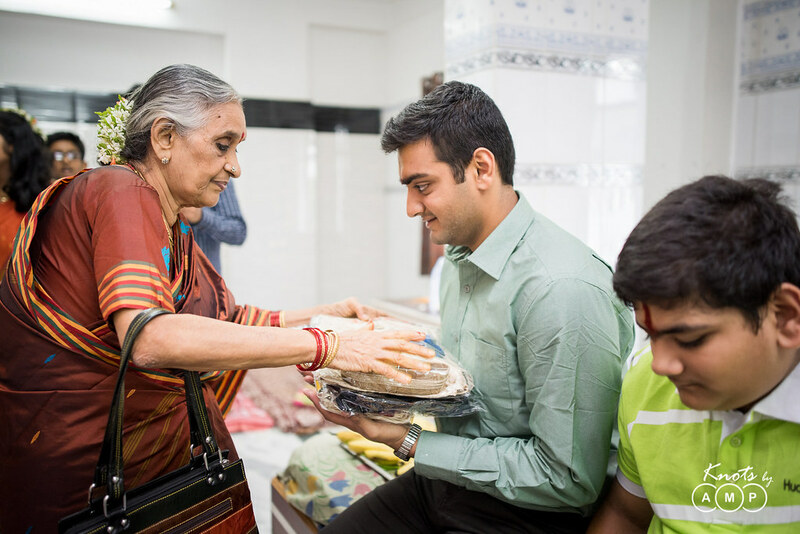 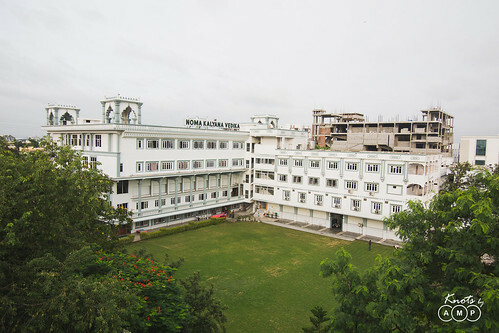 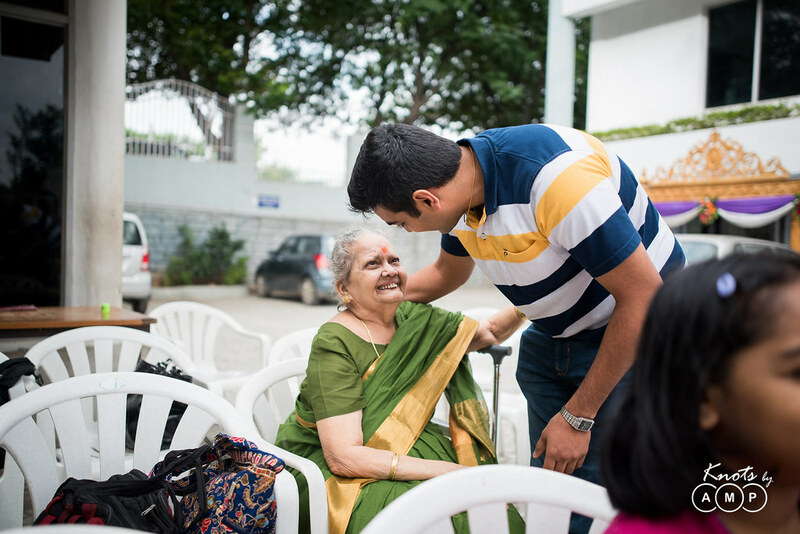 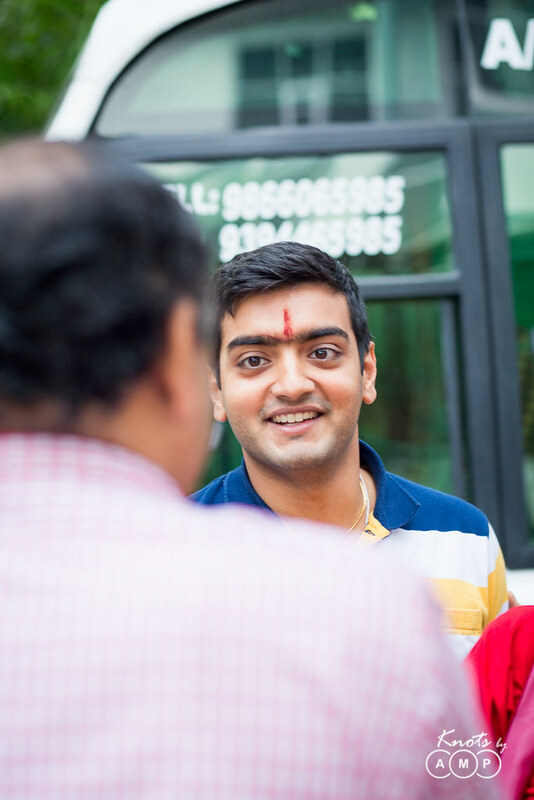 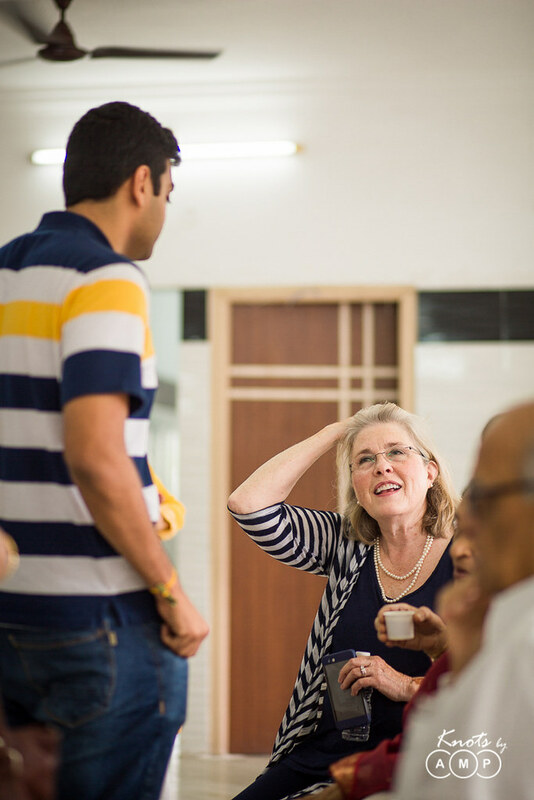 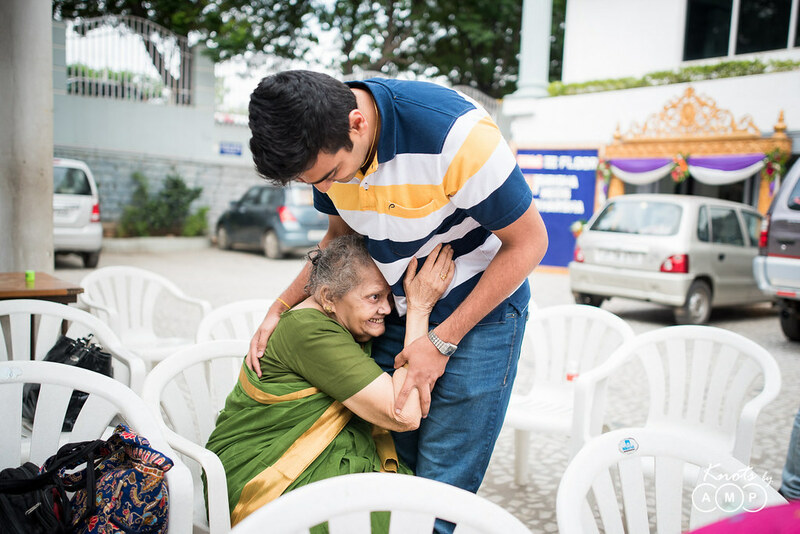 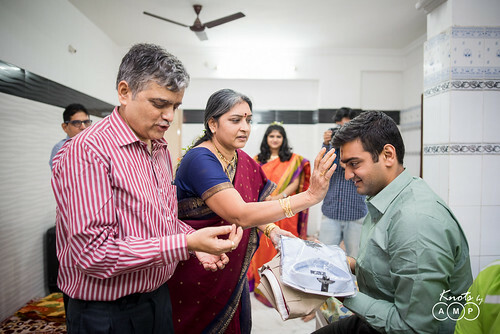 Aditya, an IIT Kharagpur alumni who is currently finishing his PhD, first met Sahiti, who was pursuing a Master’s degree in Public Health, in their college University of Minessota in US. 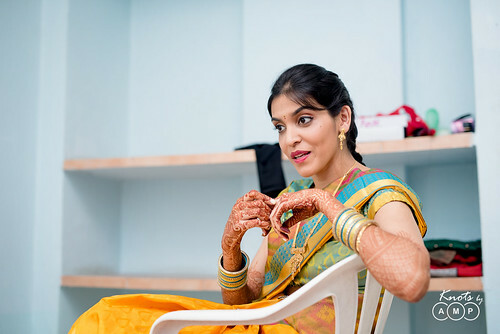 I first came to know about Sahiti when he was planning to propose her. 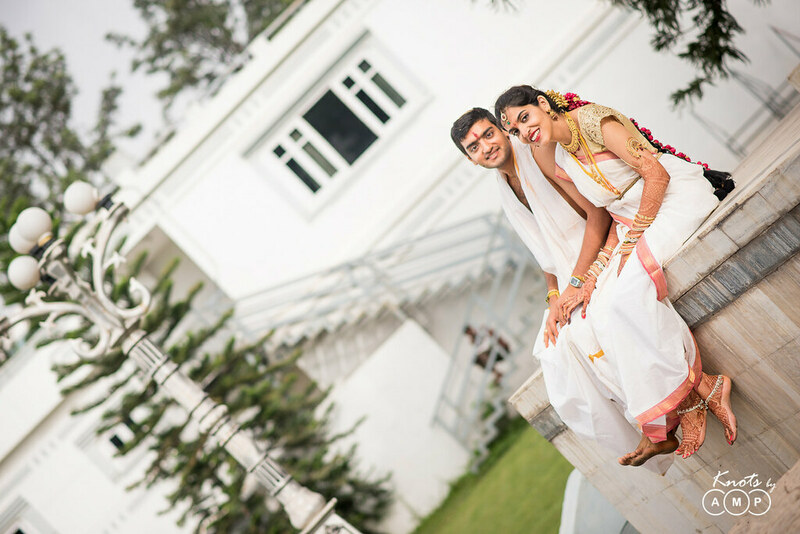 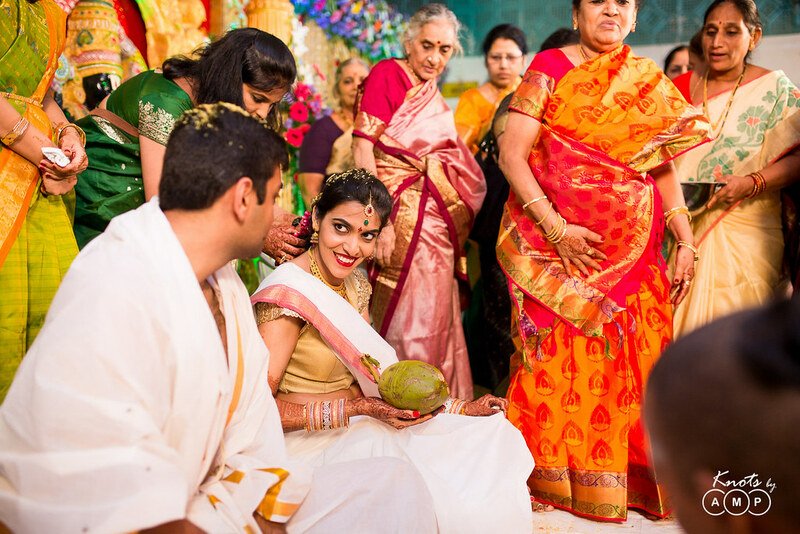 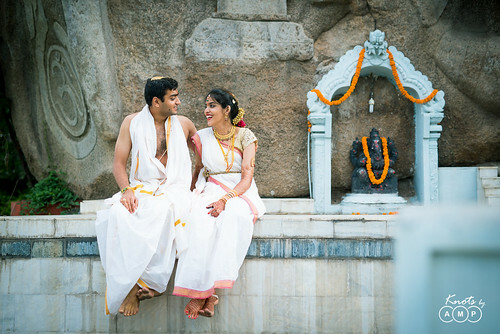 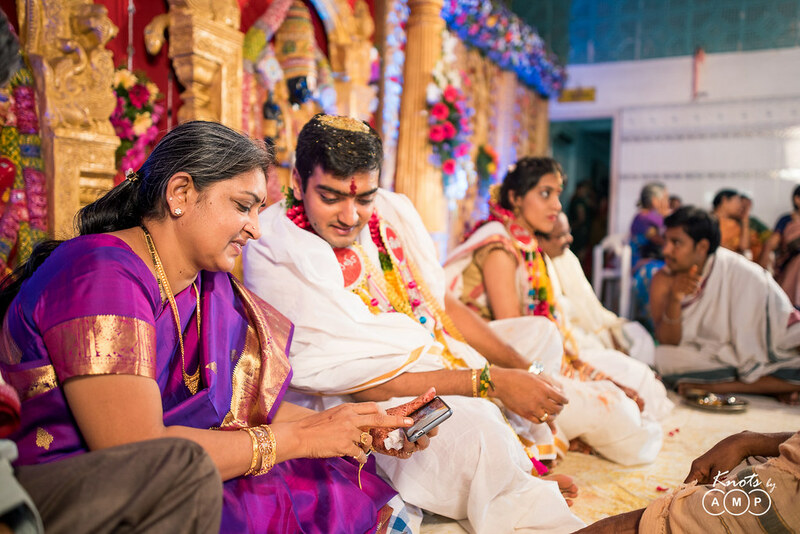 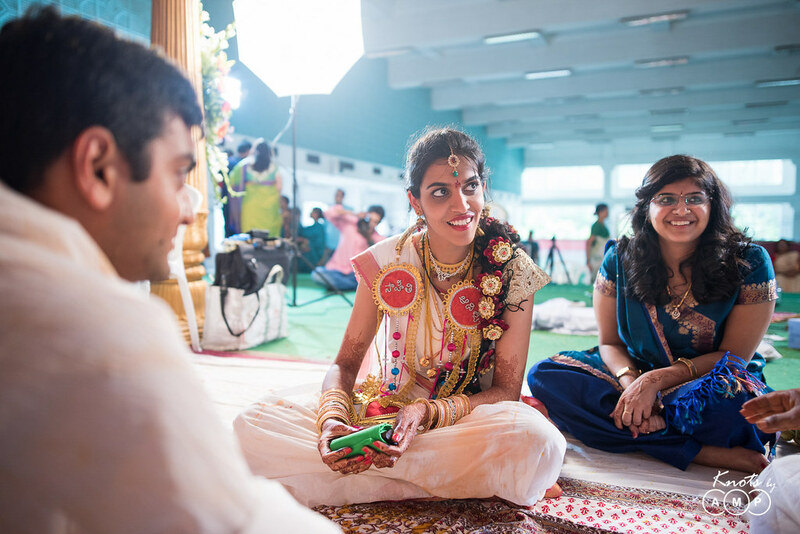 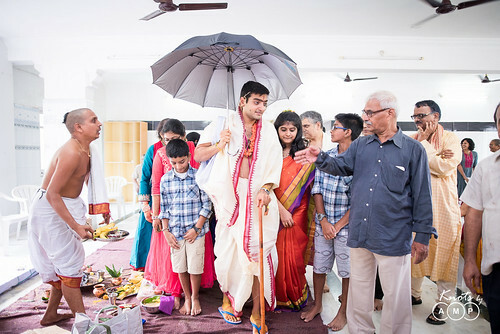 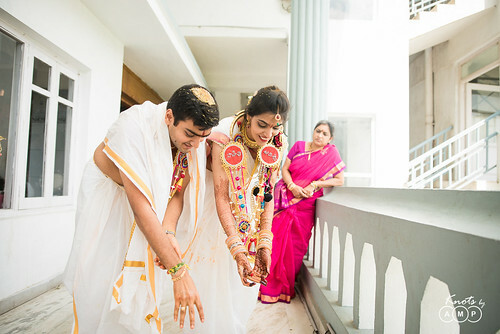 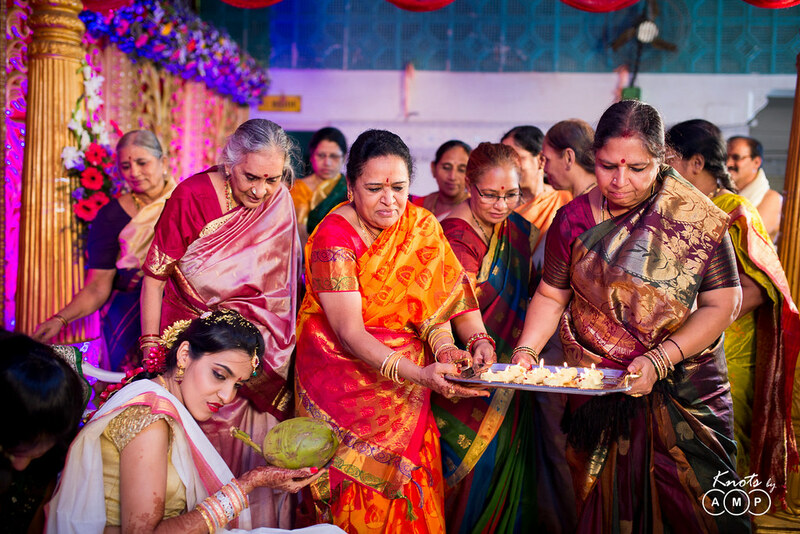 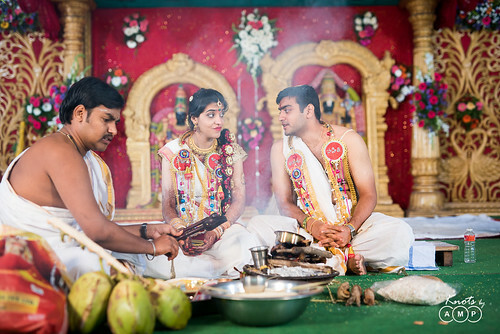 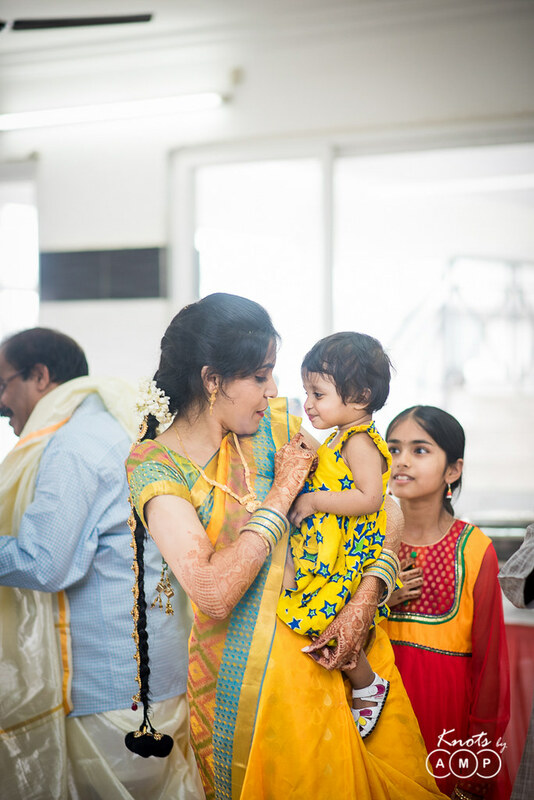 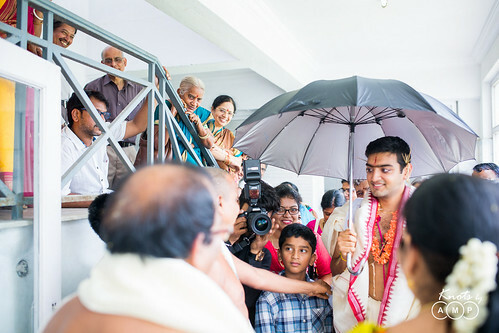 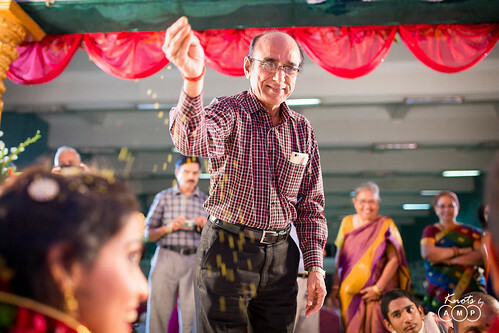 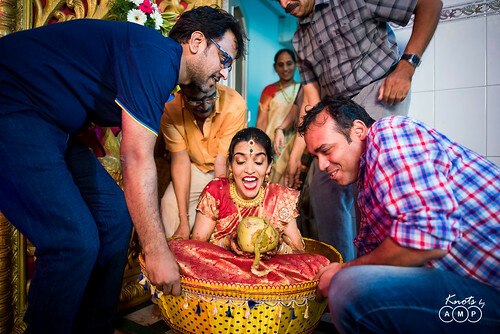 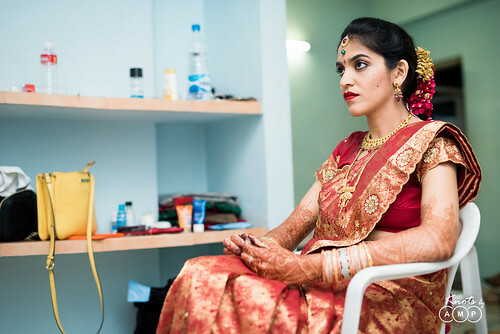 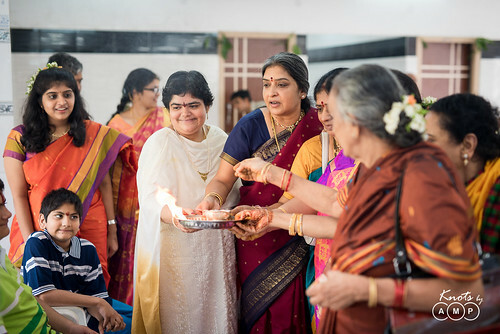 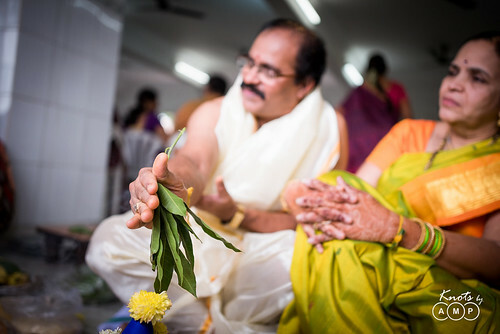 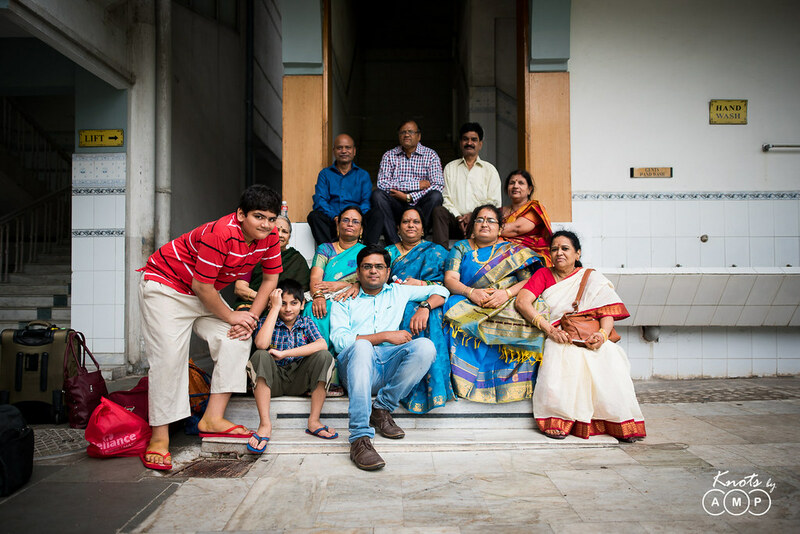 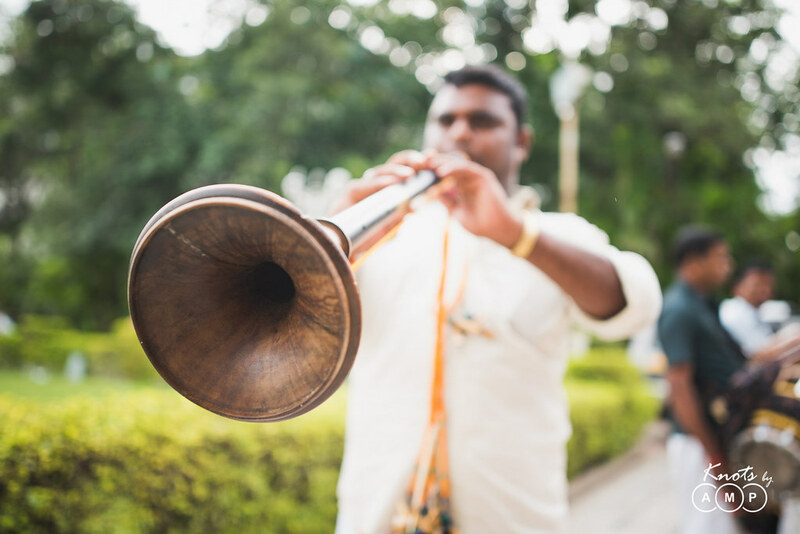 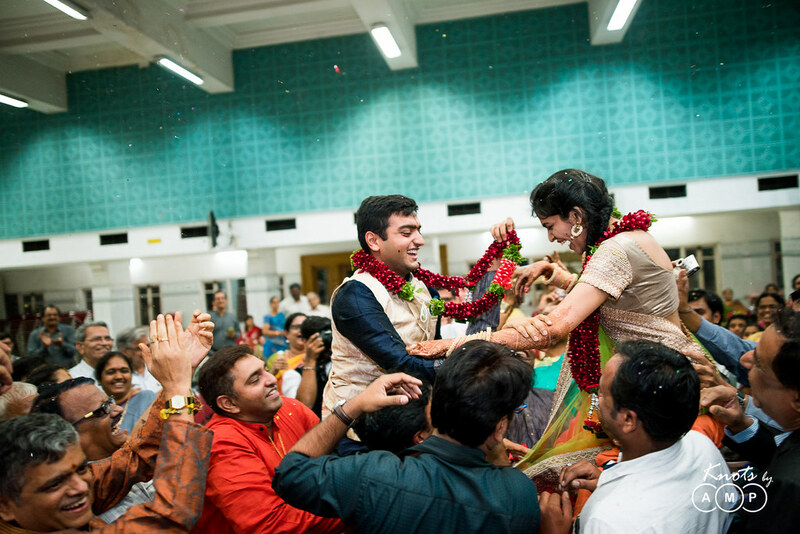 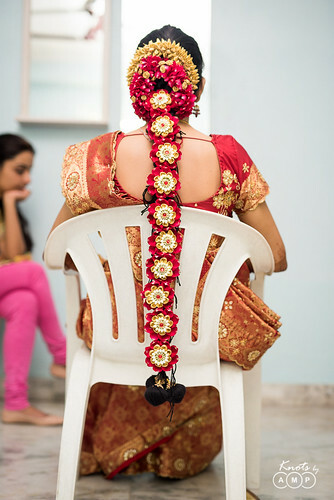 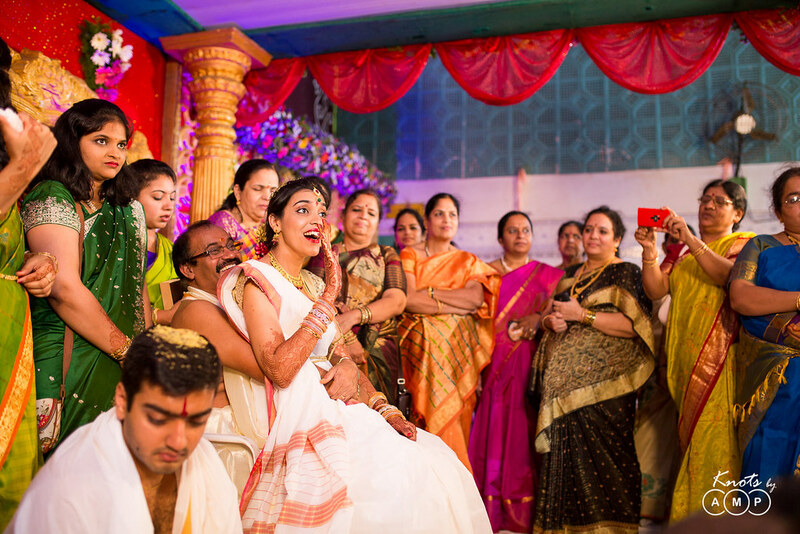 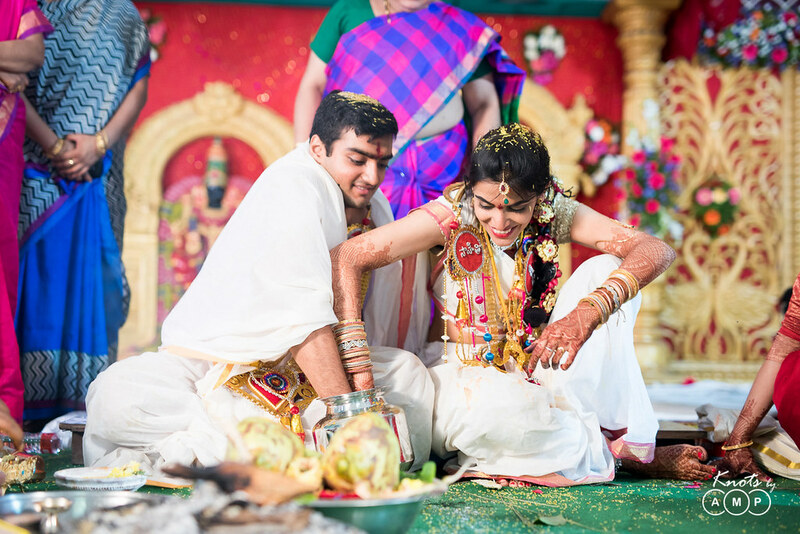 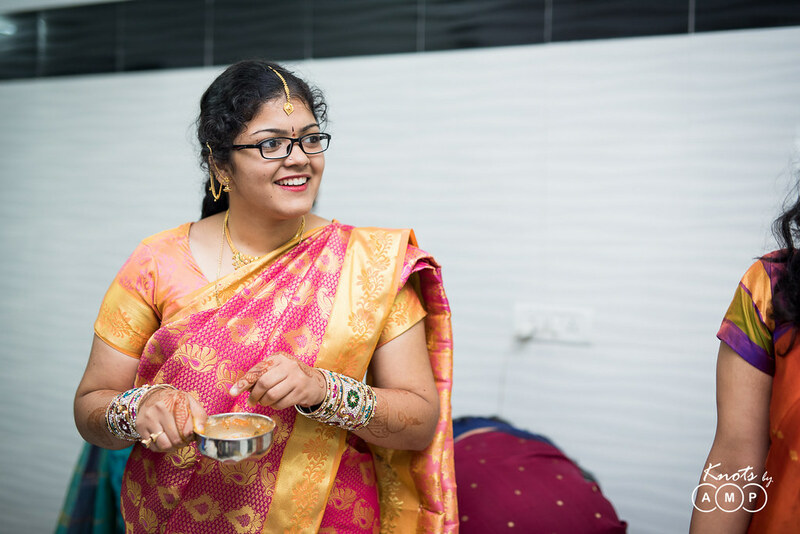 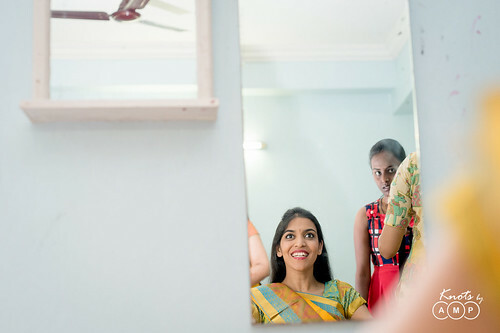 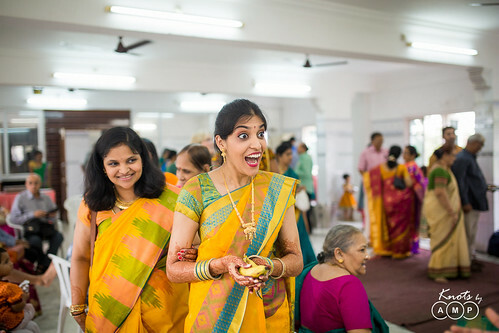 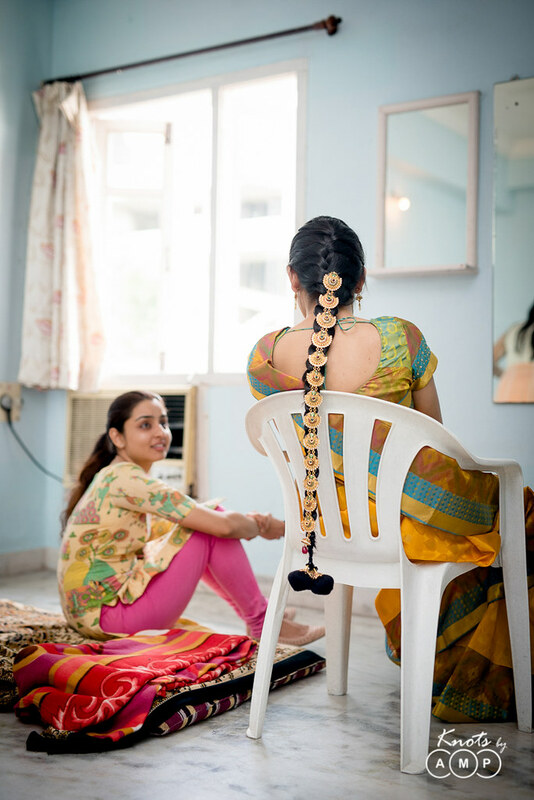 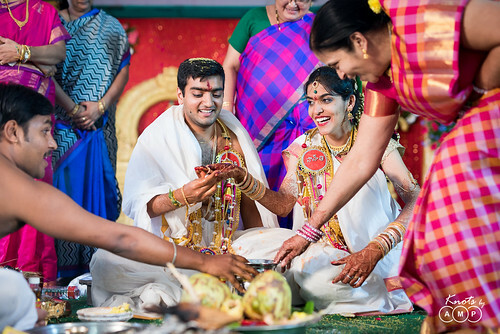 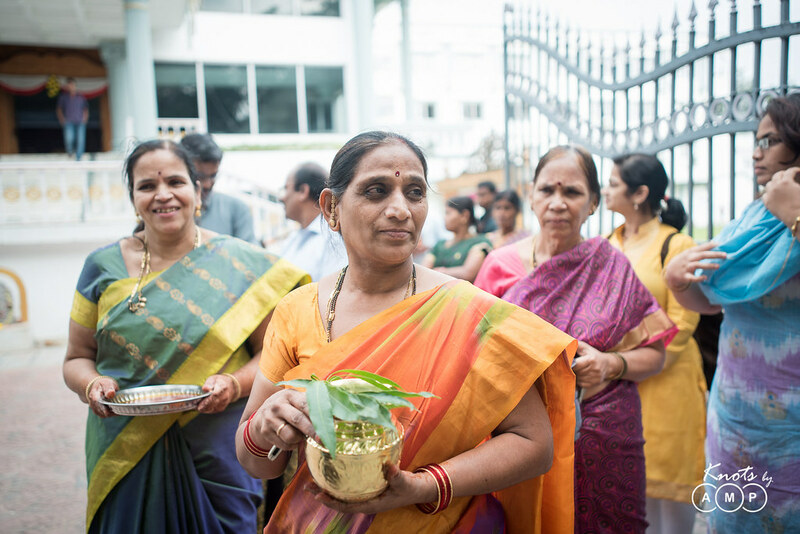 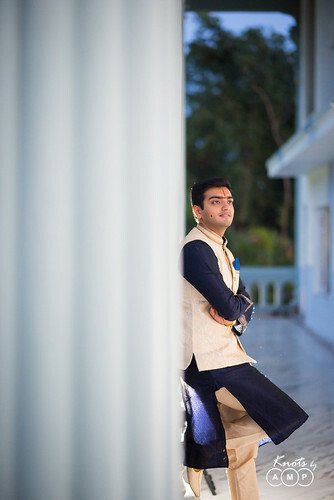 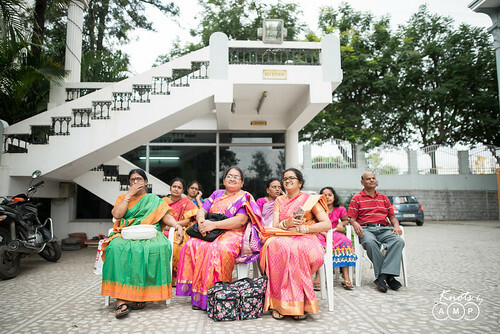 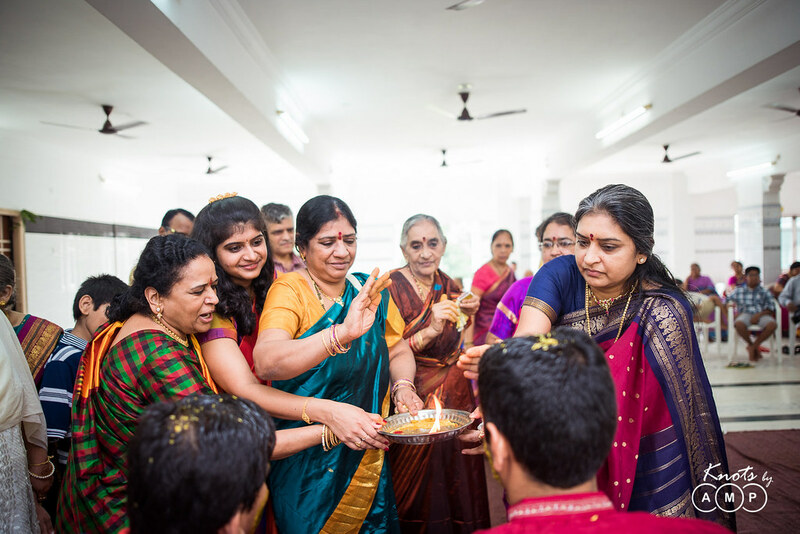 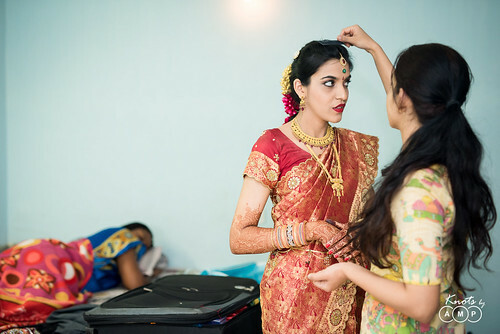 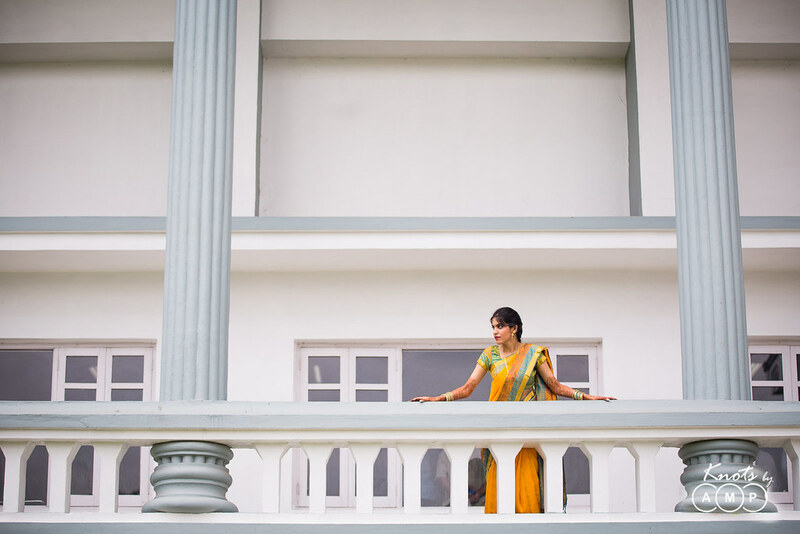 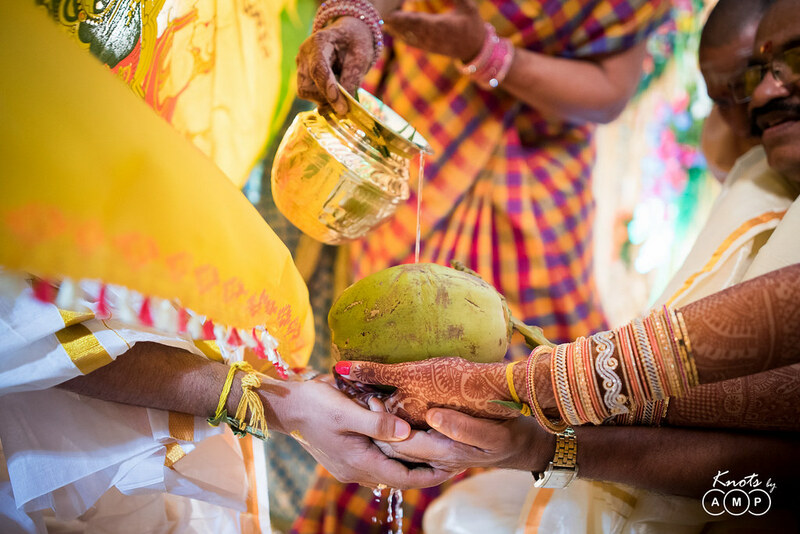 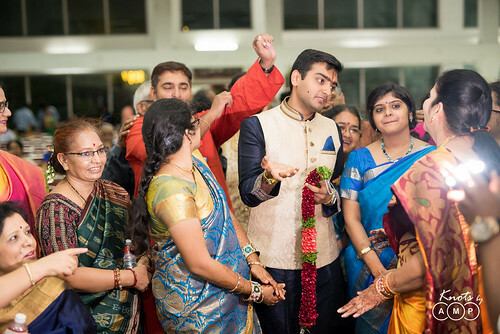 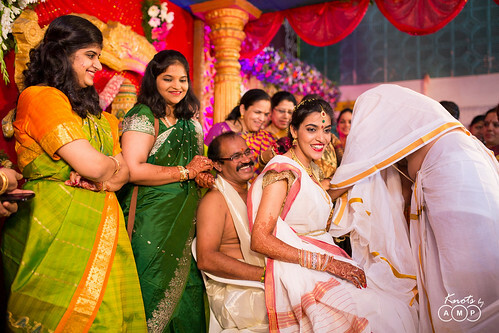 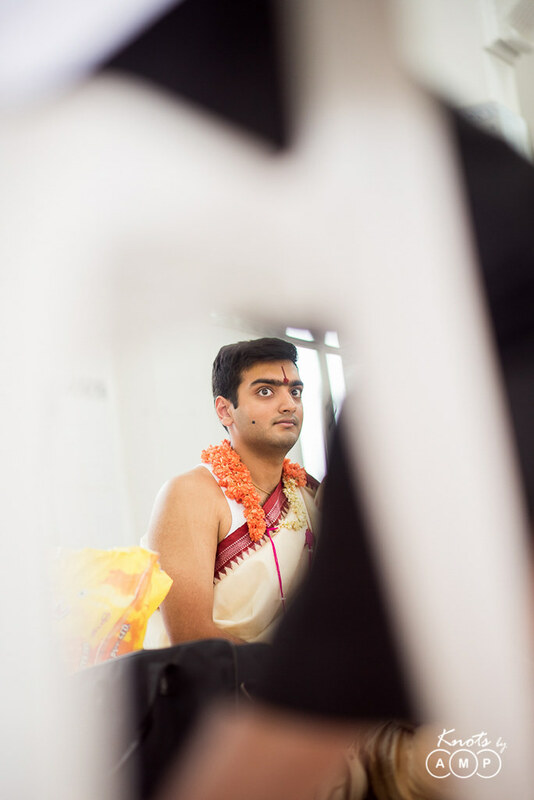 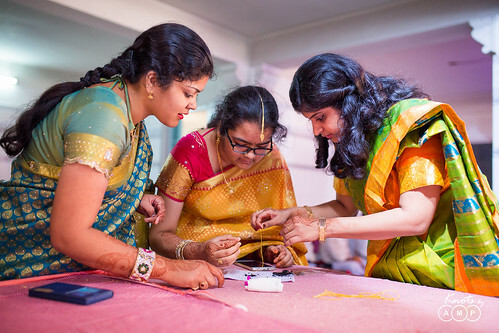 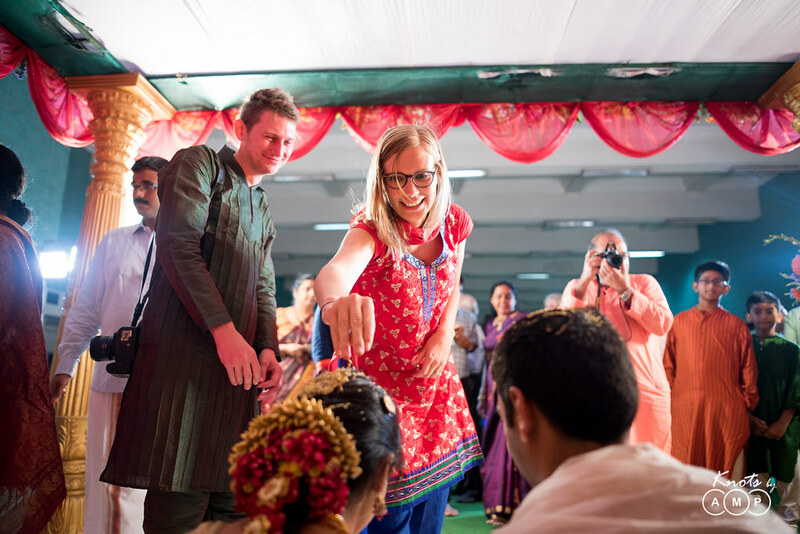 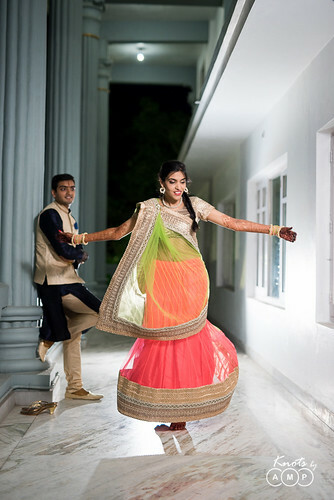 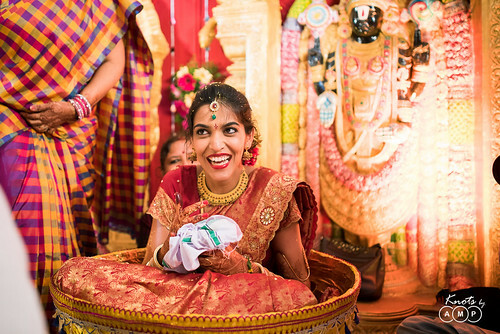 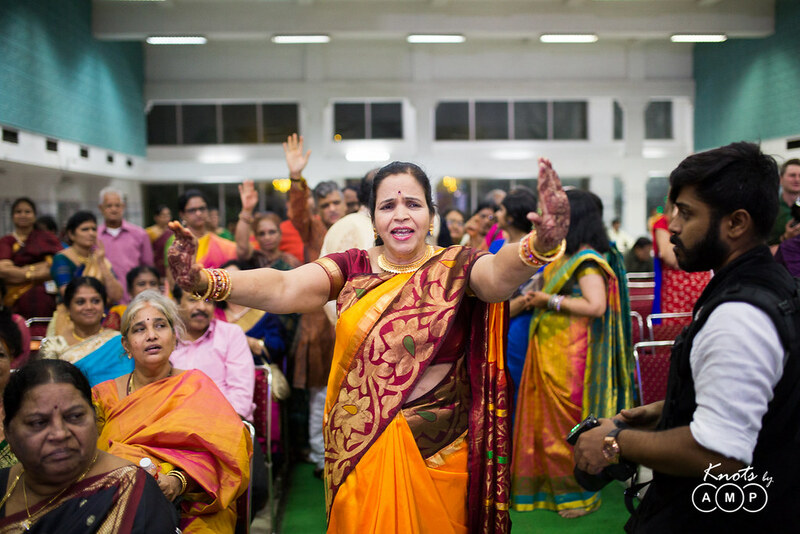 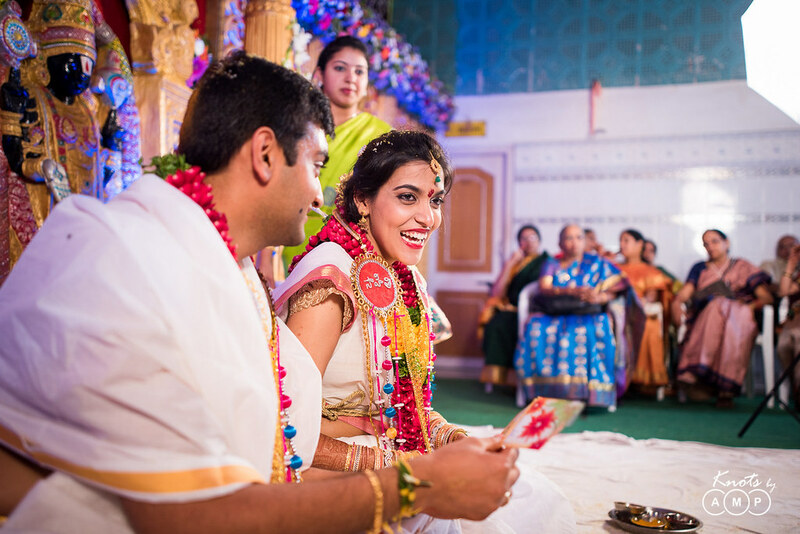 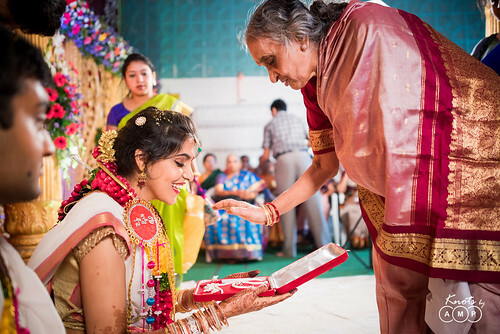 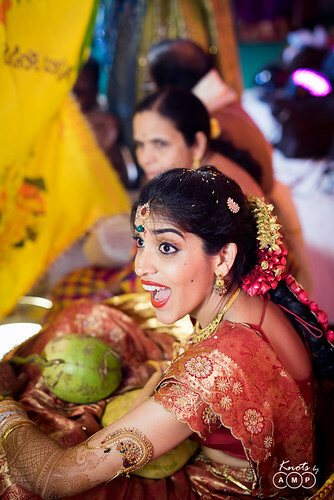 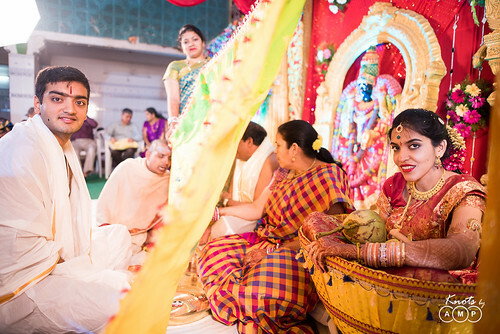 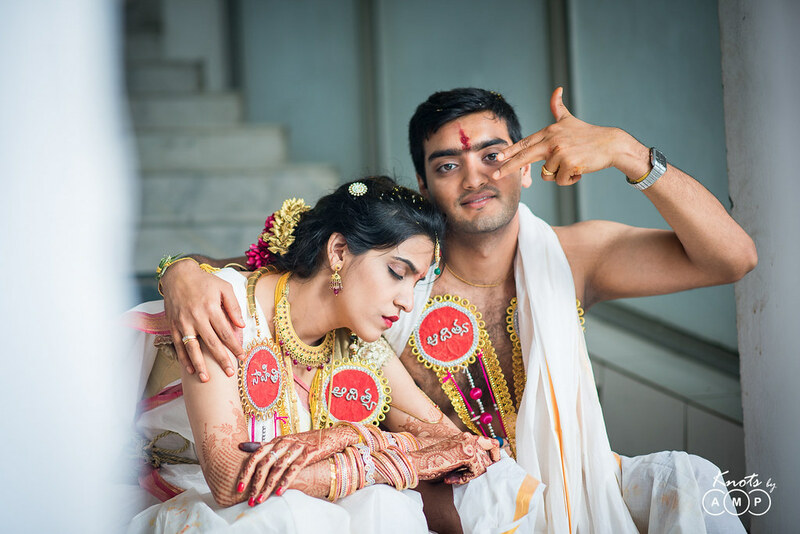 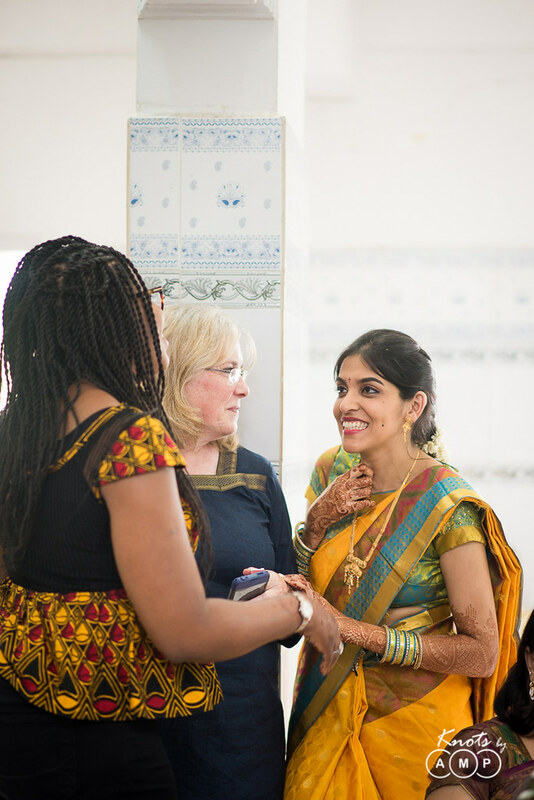 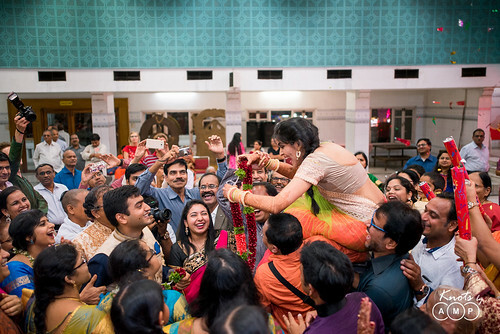 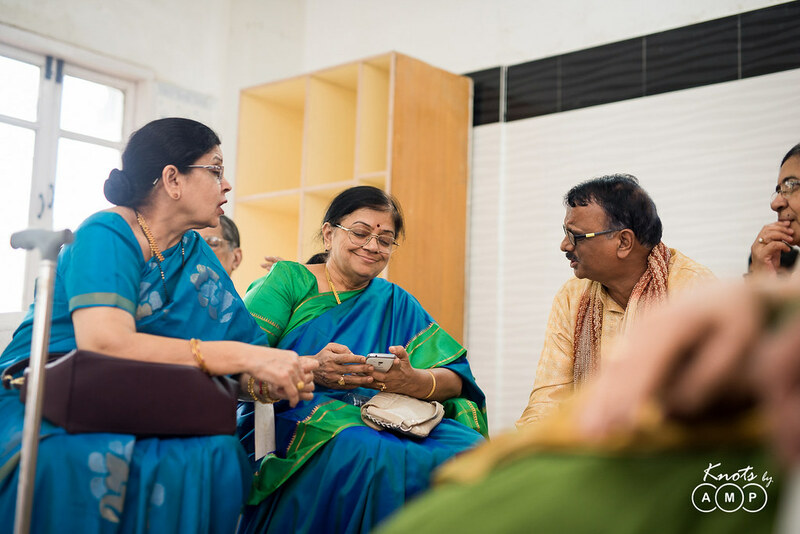 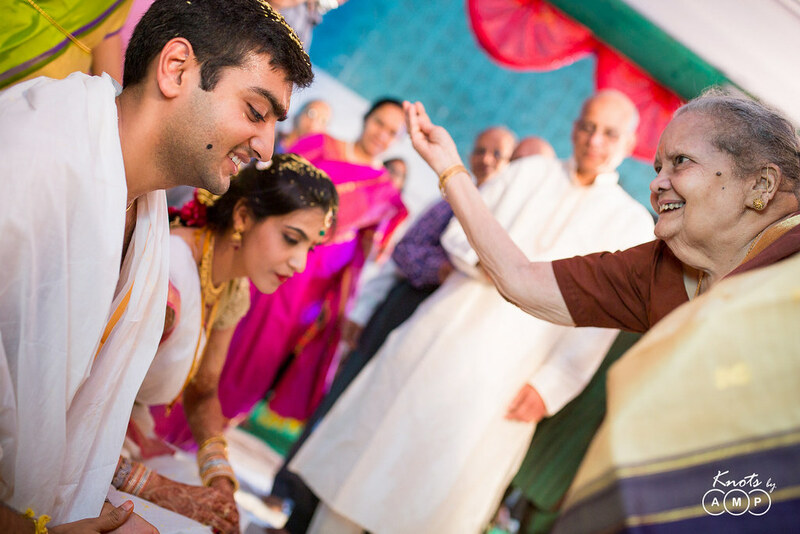 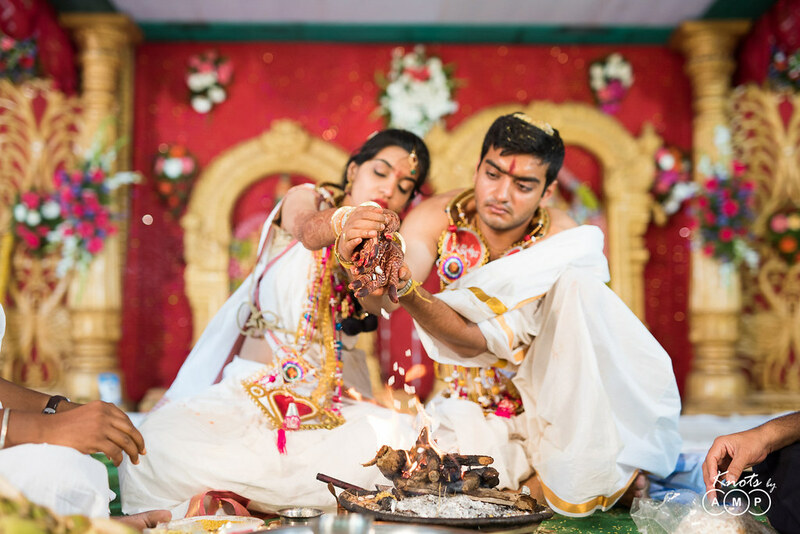 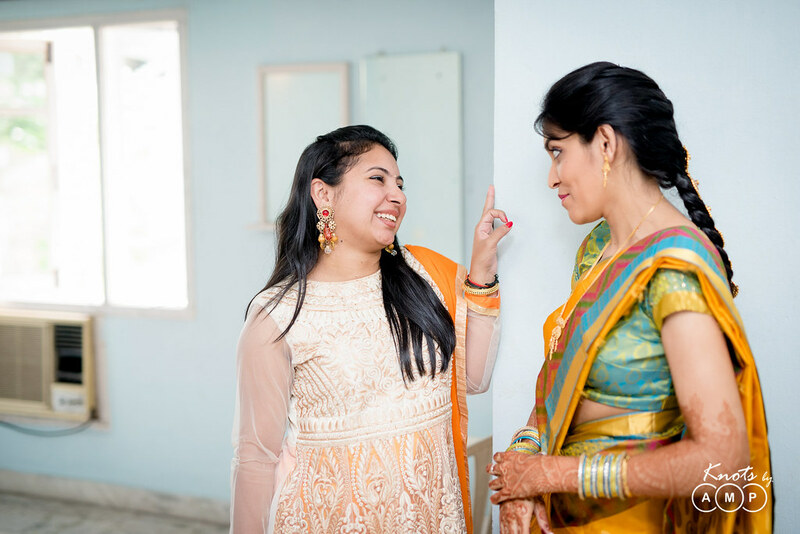 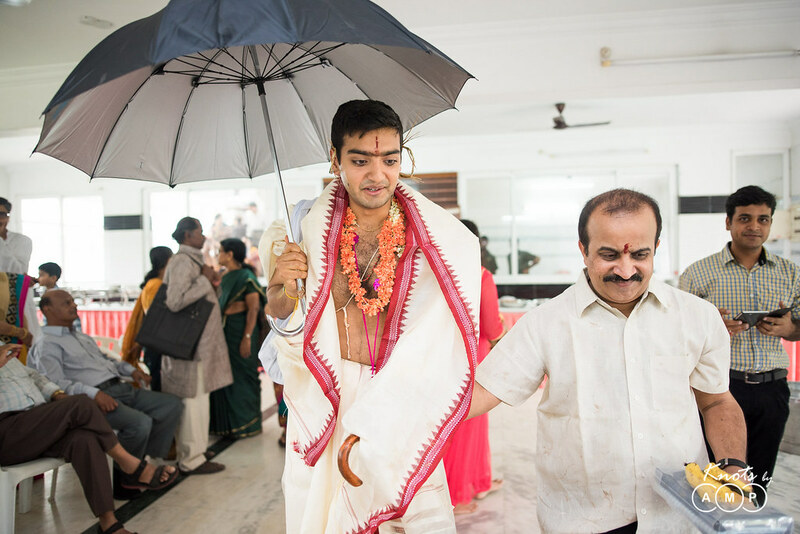 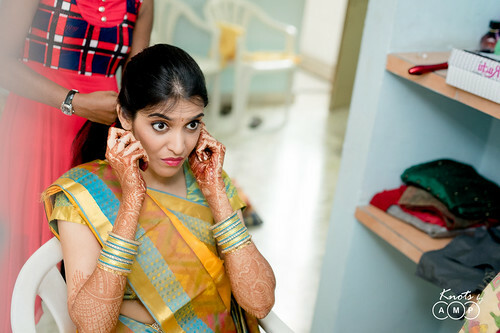 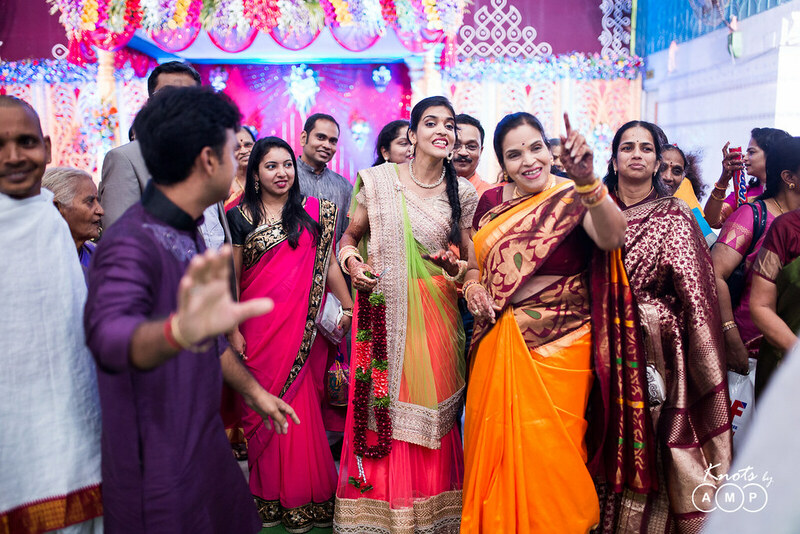 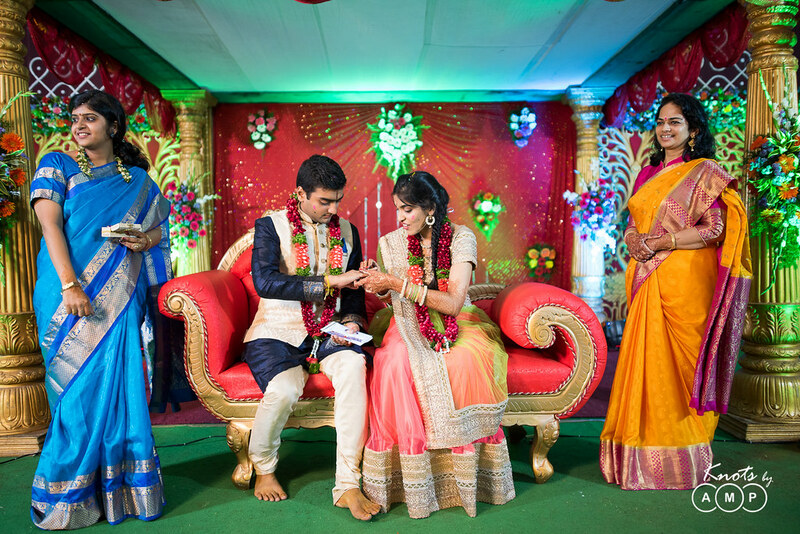 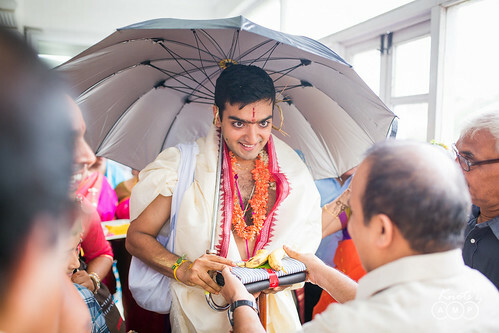 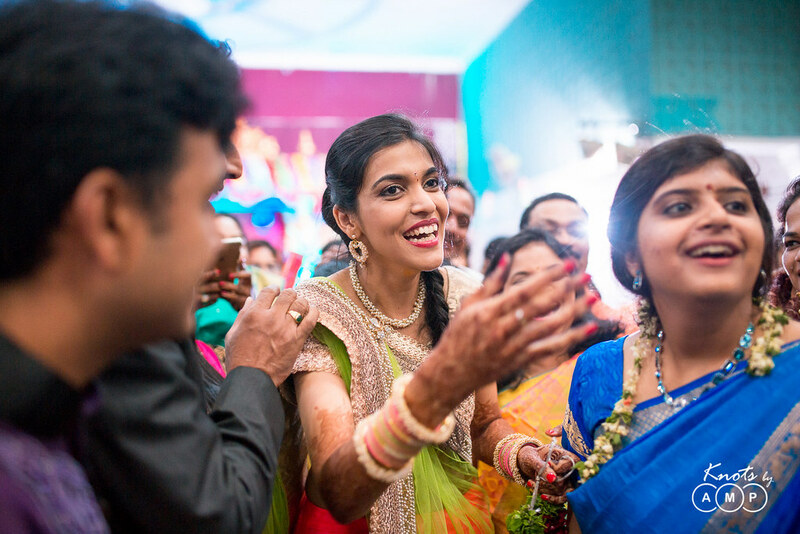 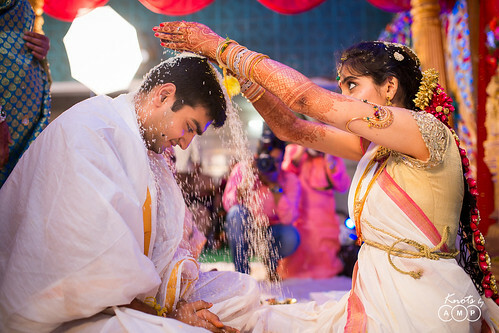 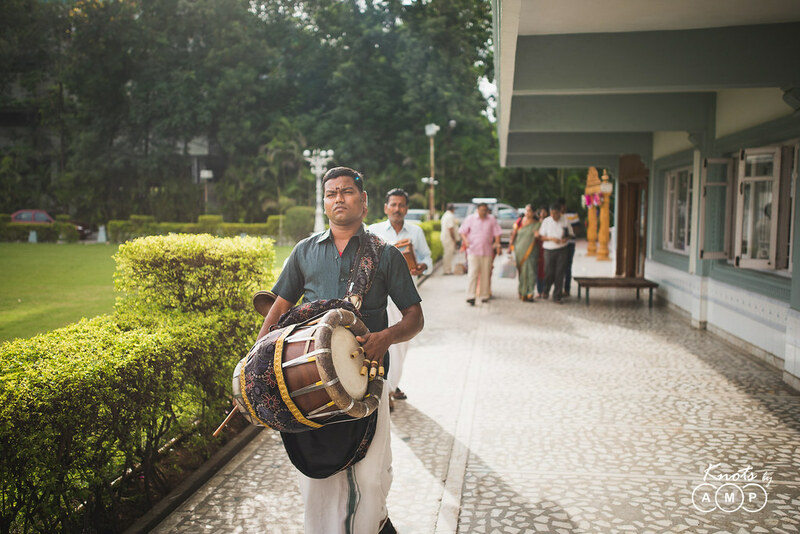 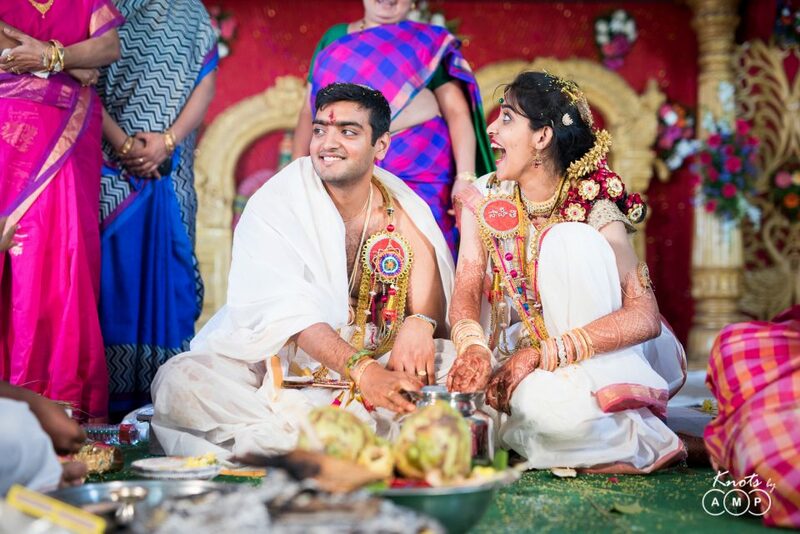 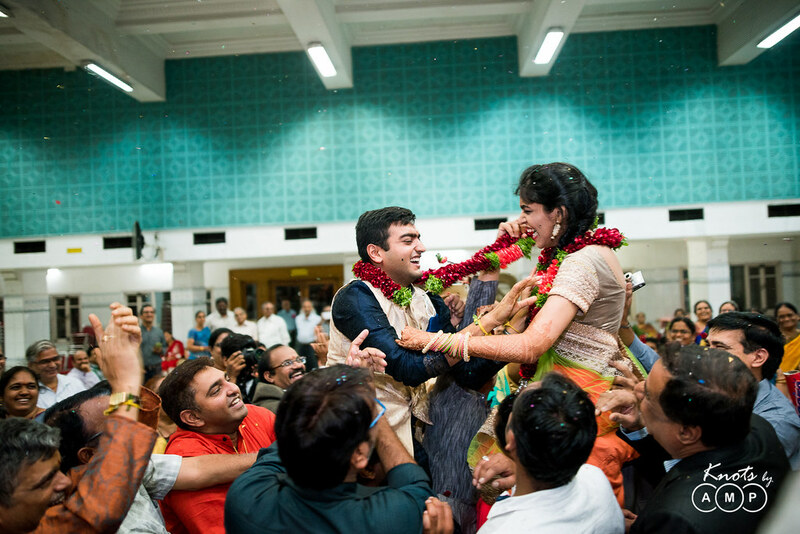 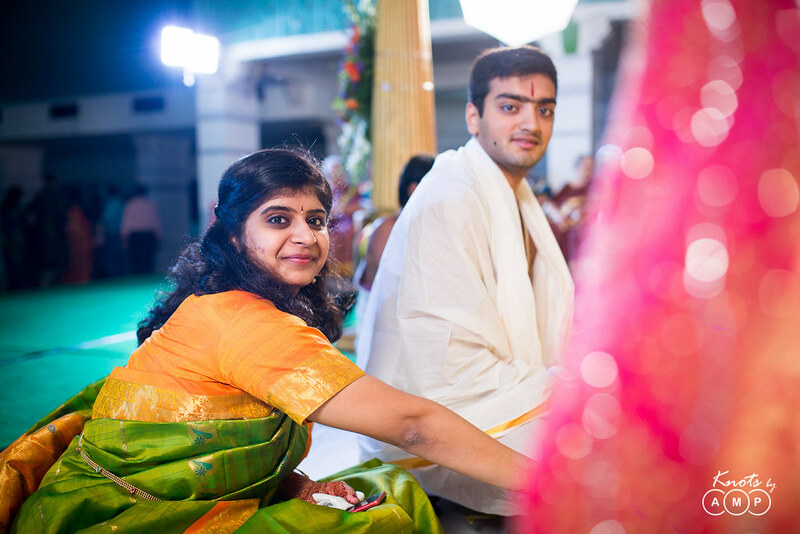 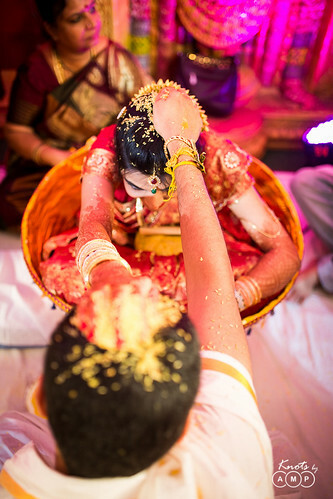 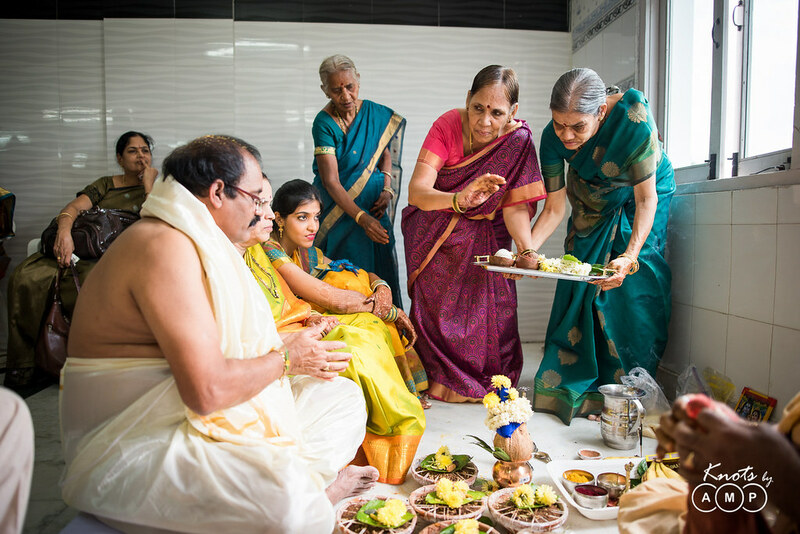 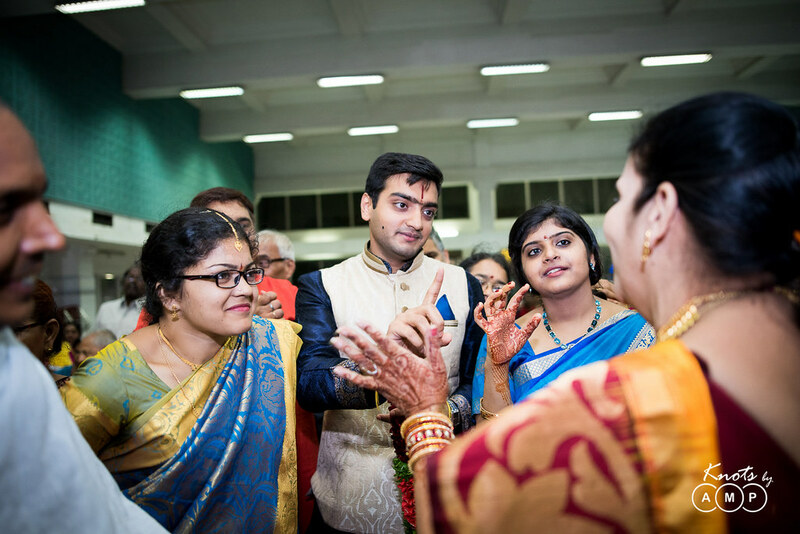 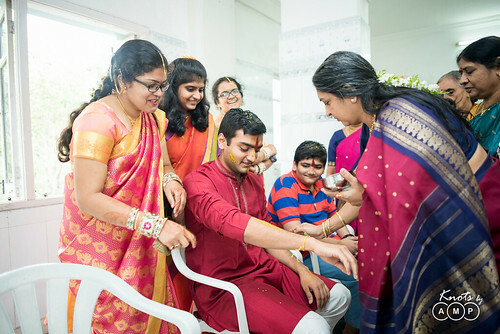 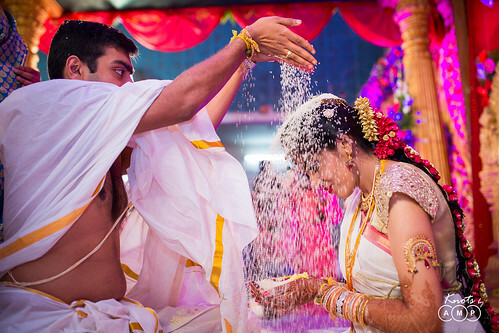 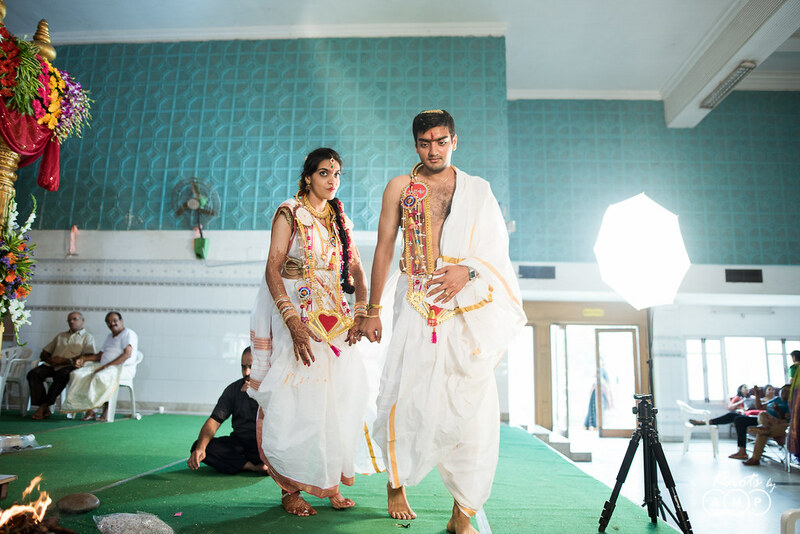 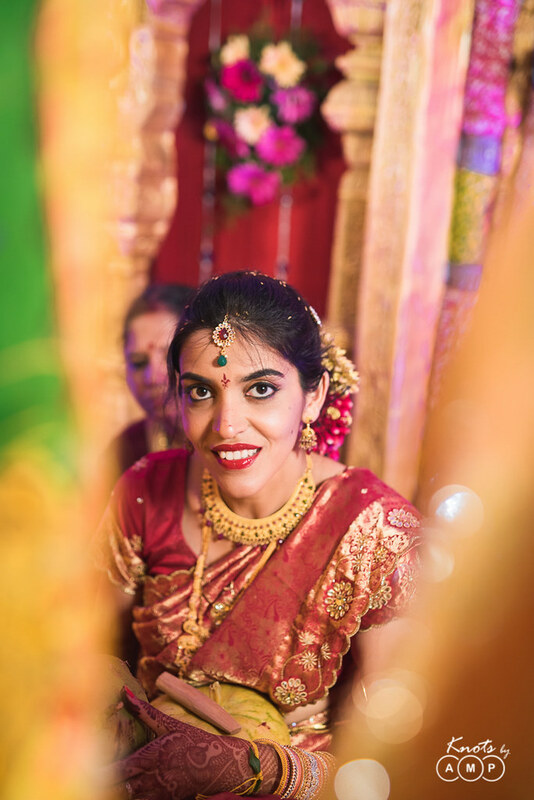 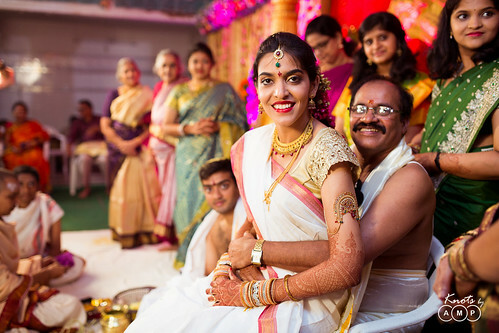 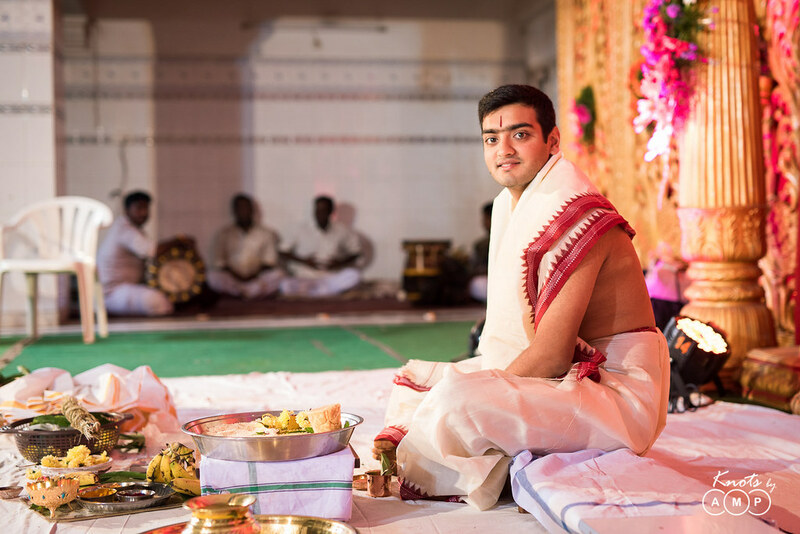 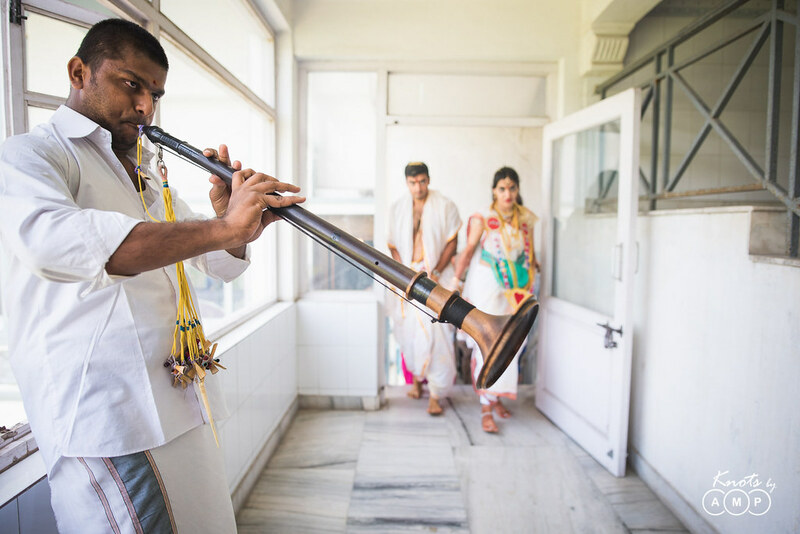 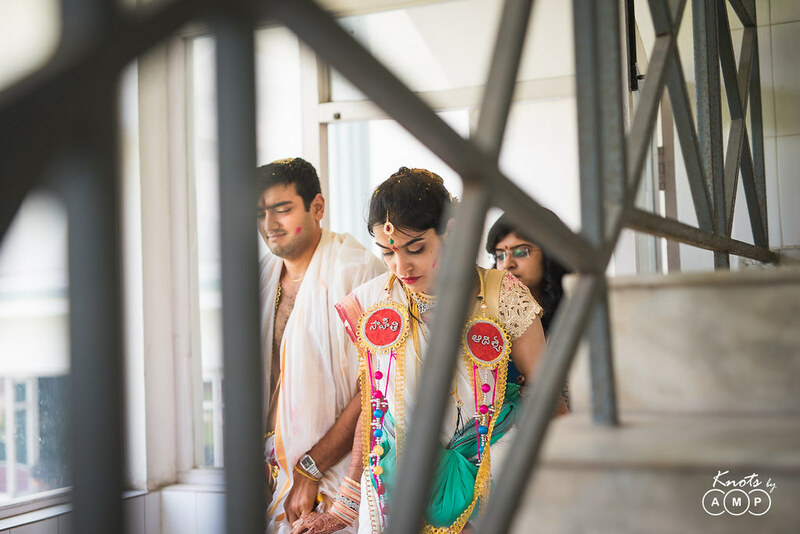 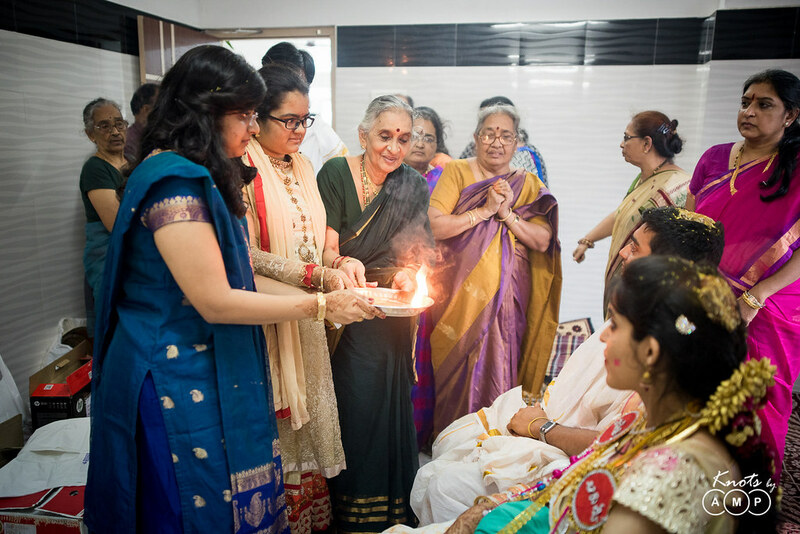 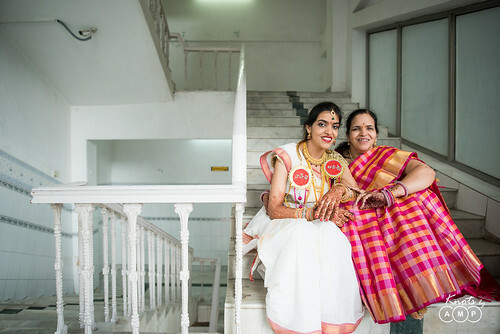 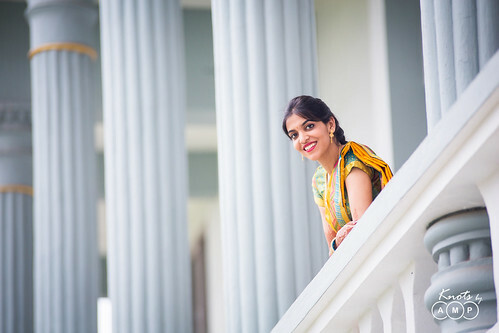 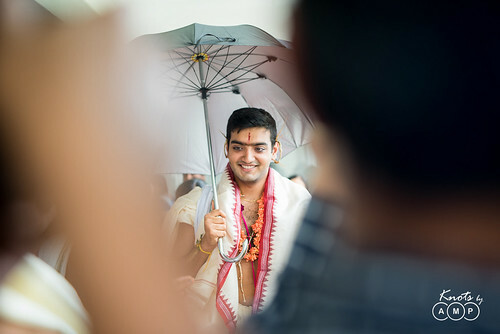 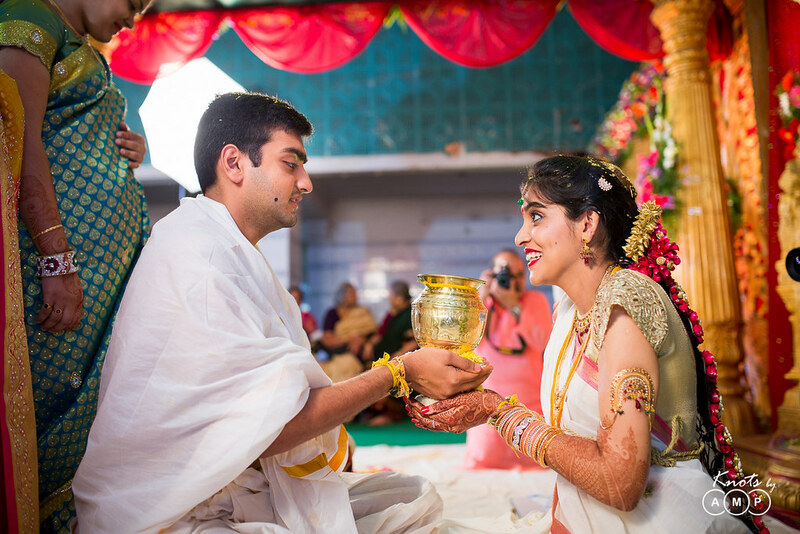 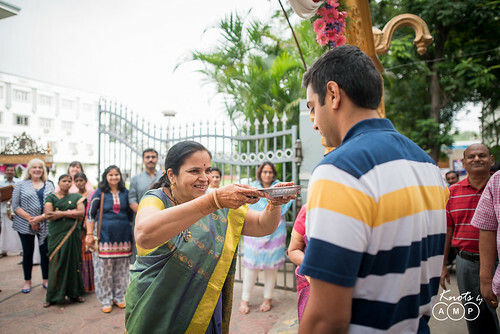 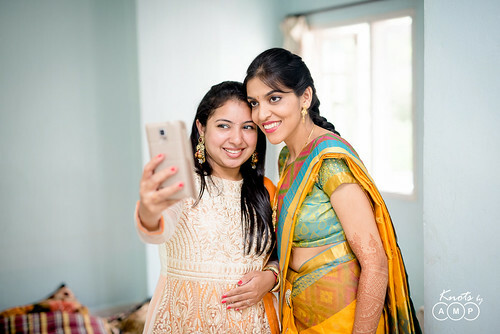 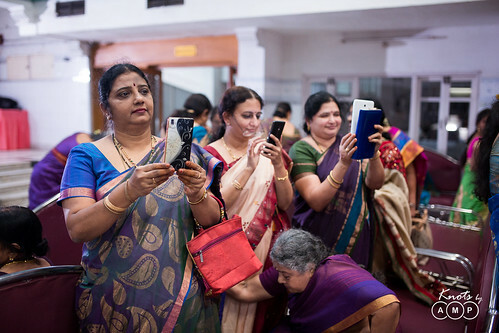 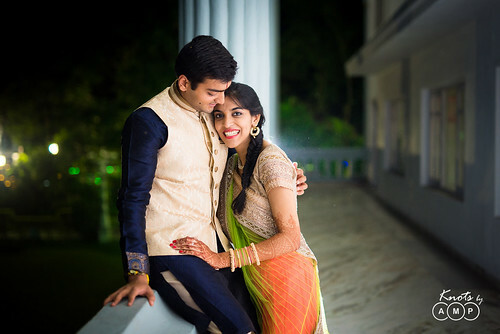 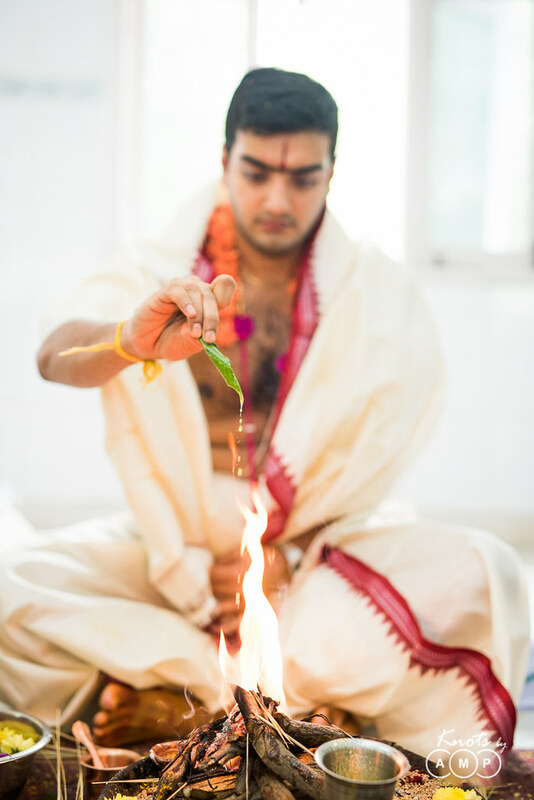 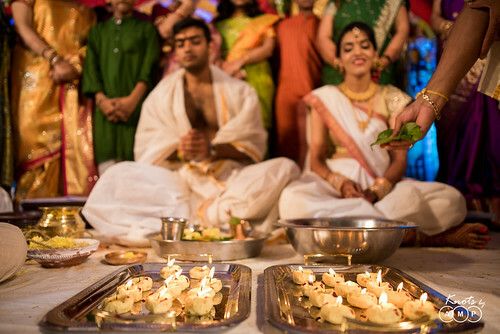 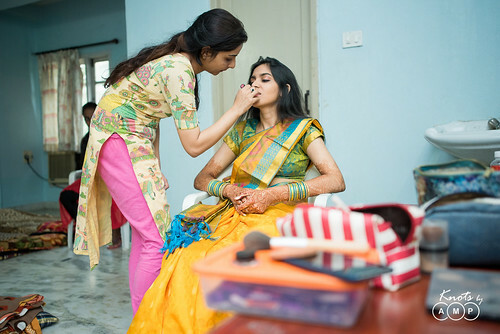 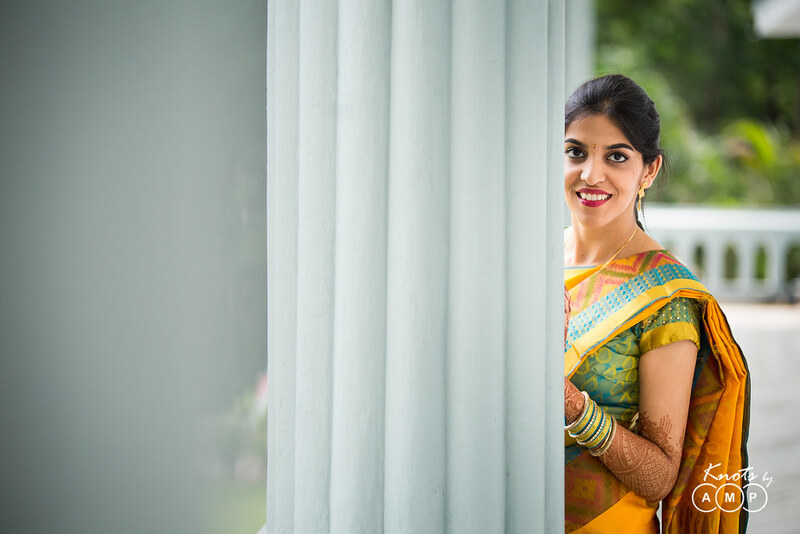 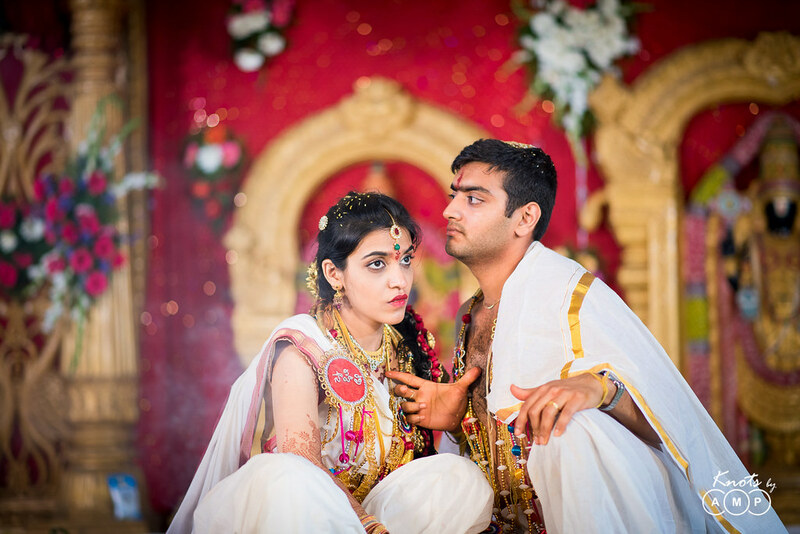 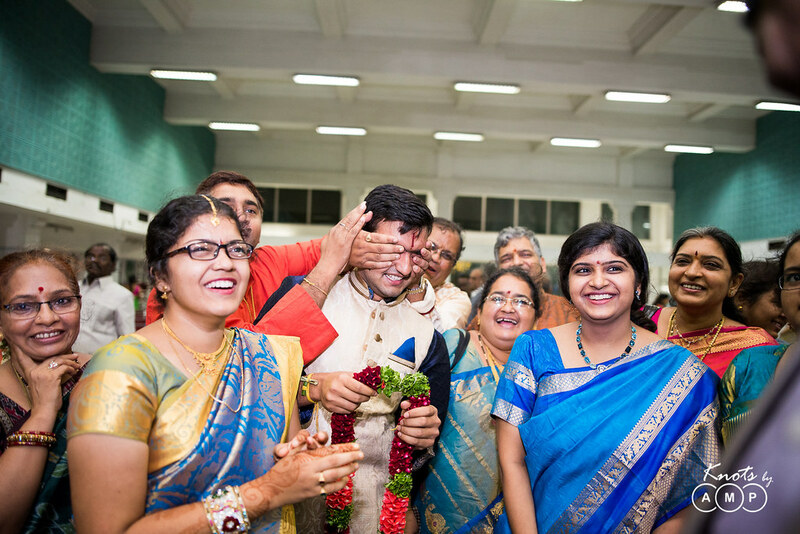 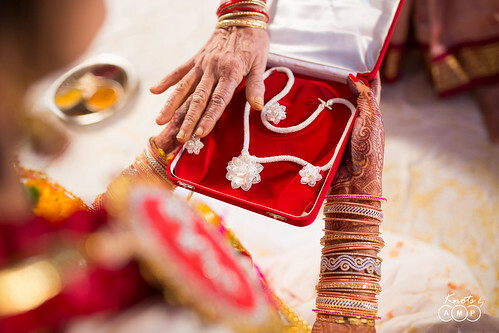 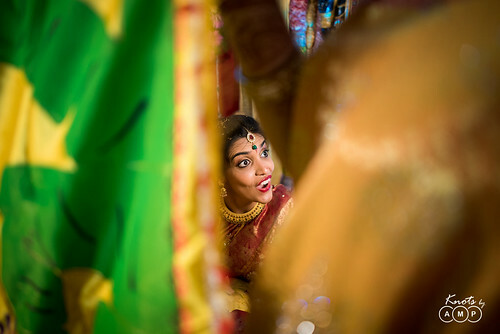 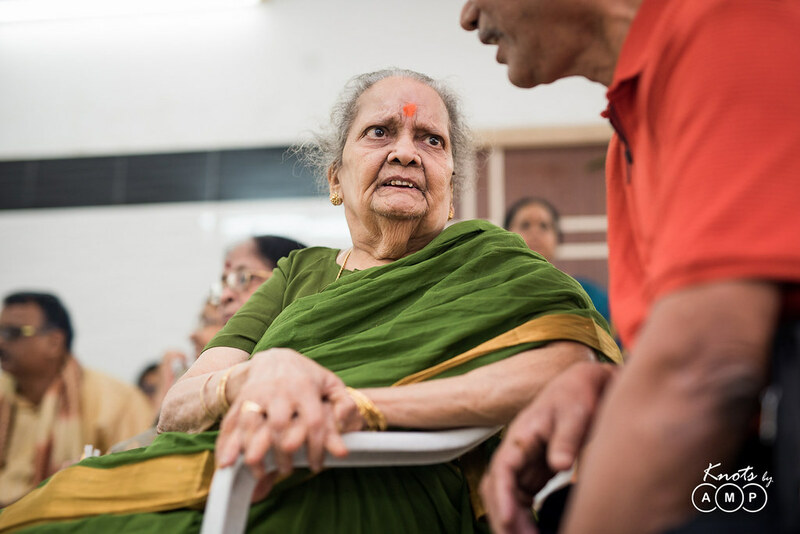 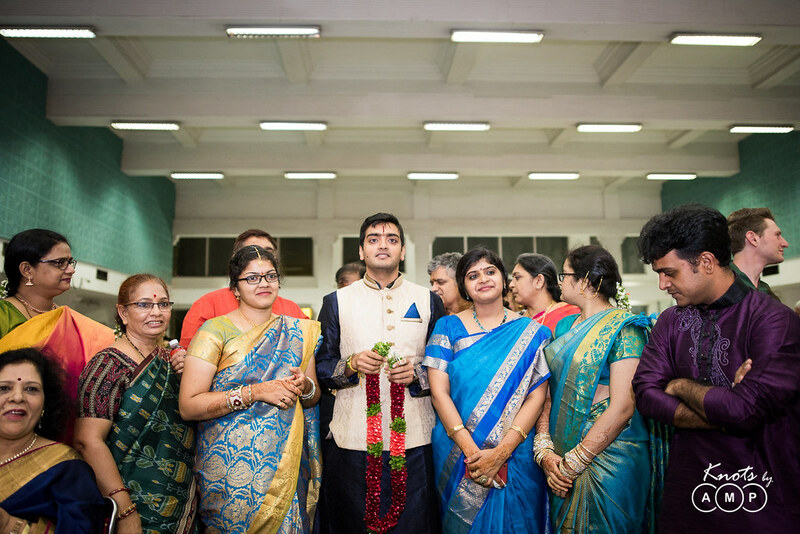 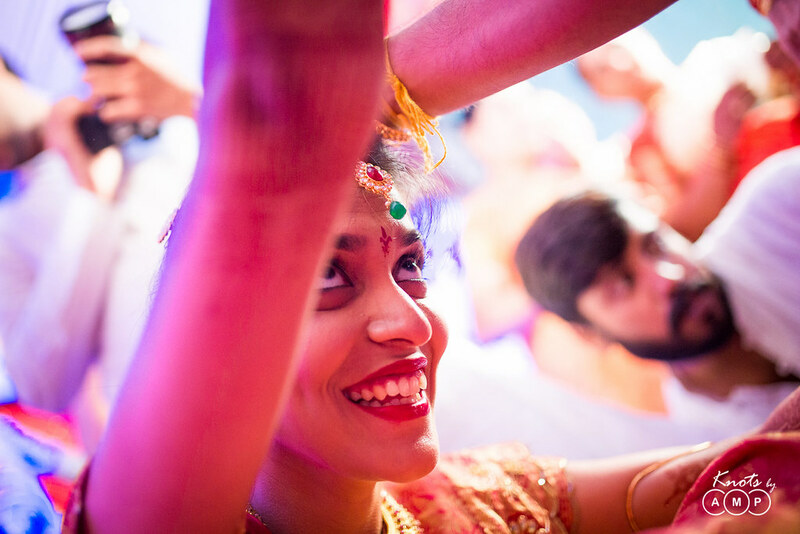 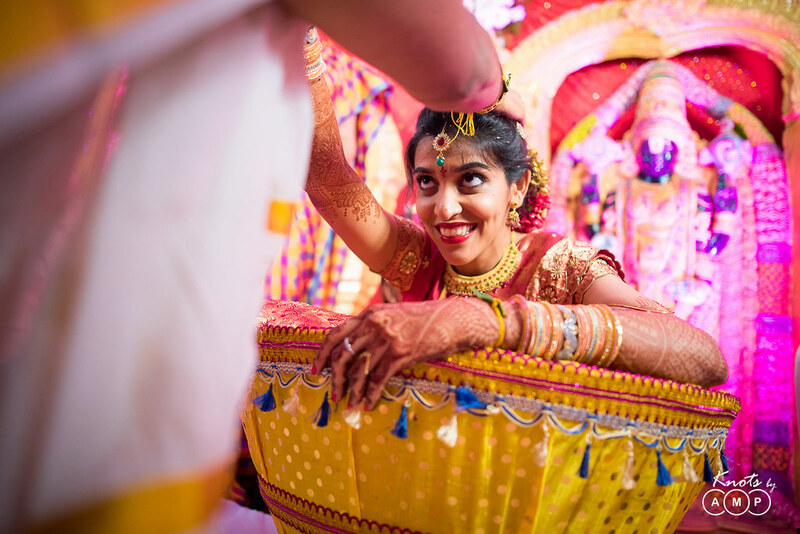 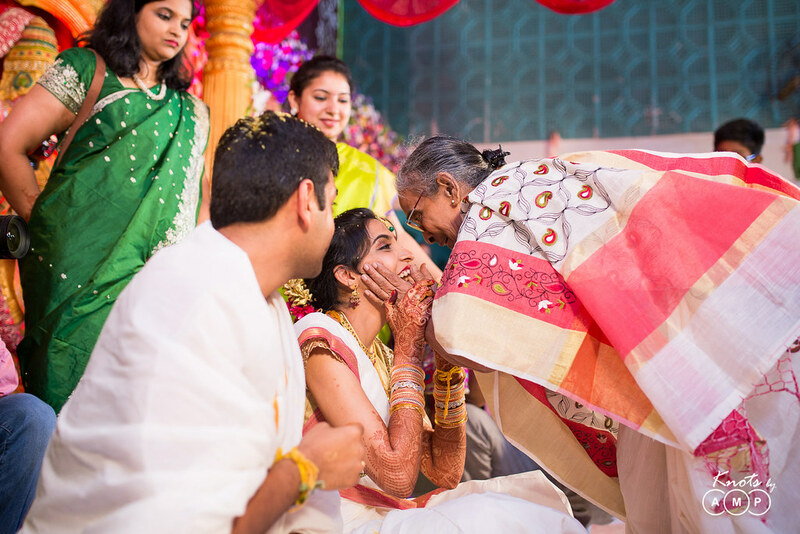 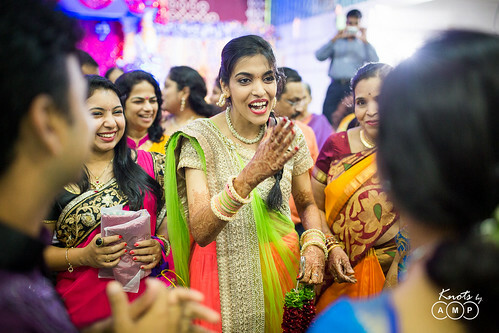 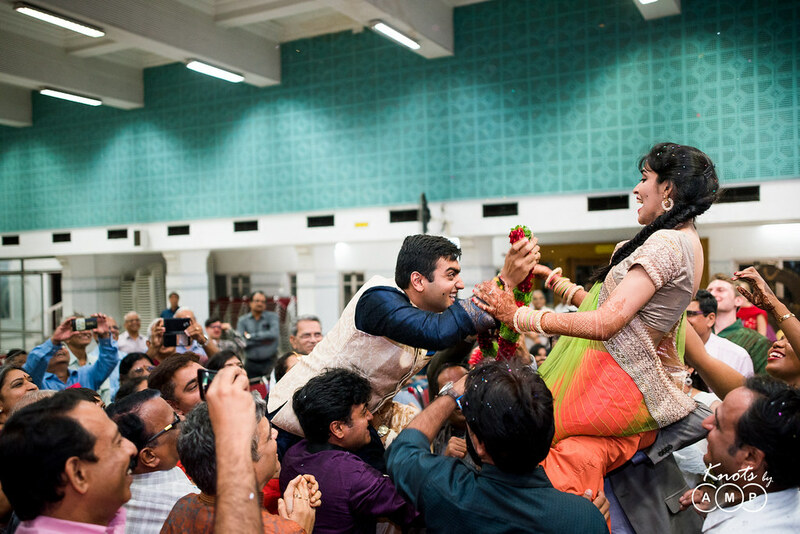 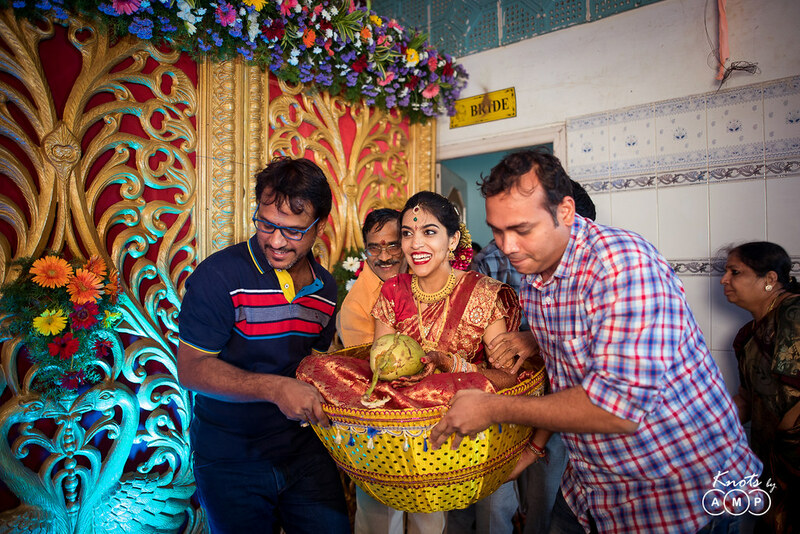 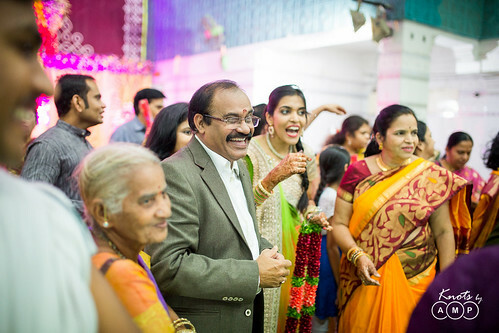 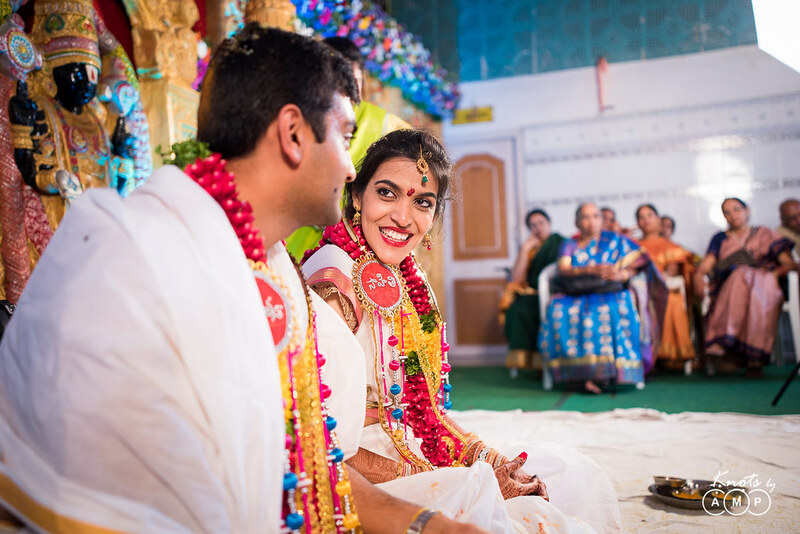 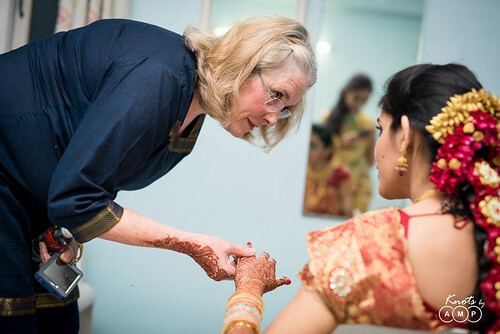 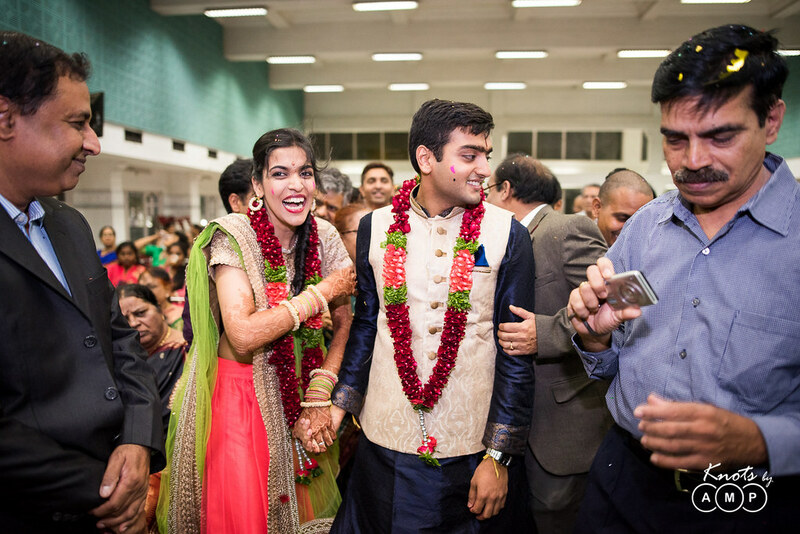 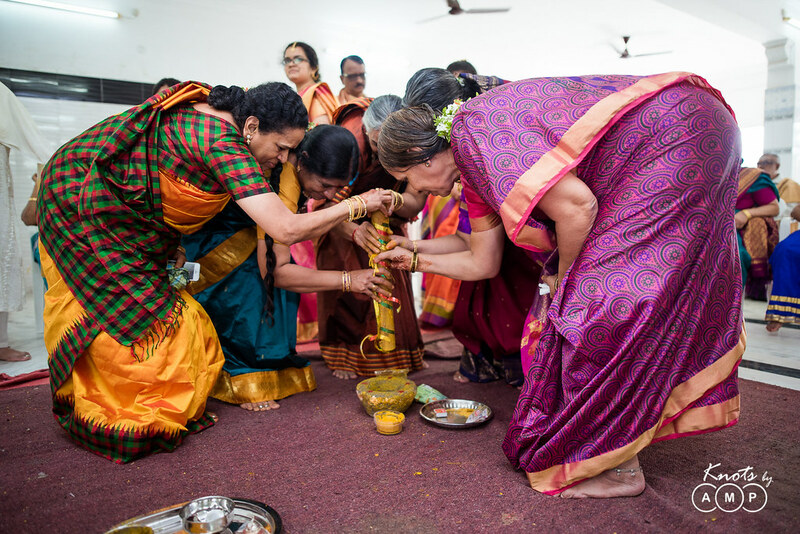 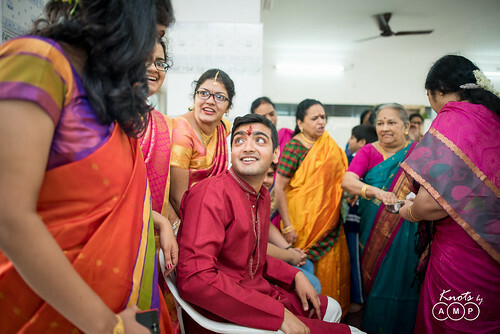 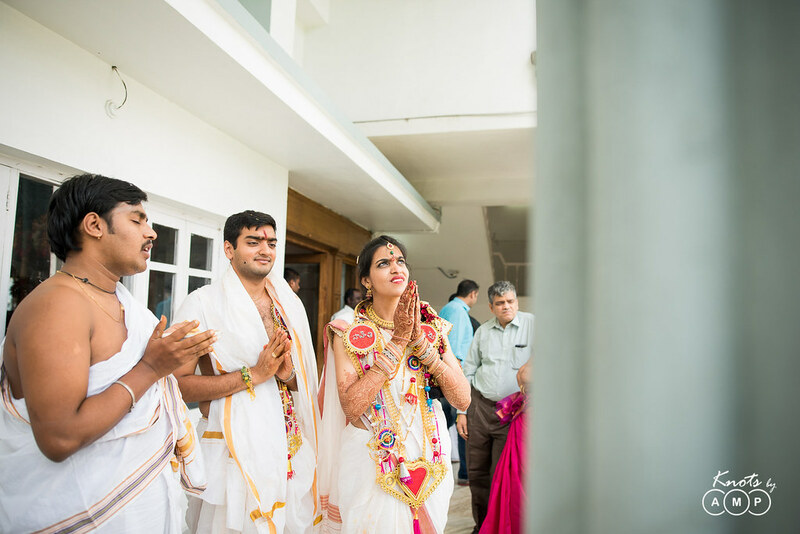 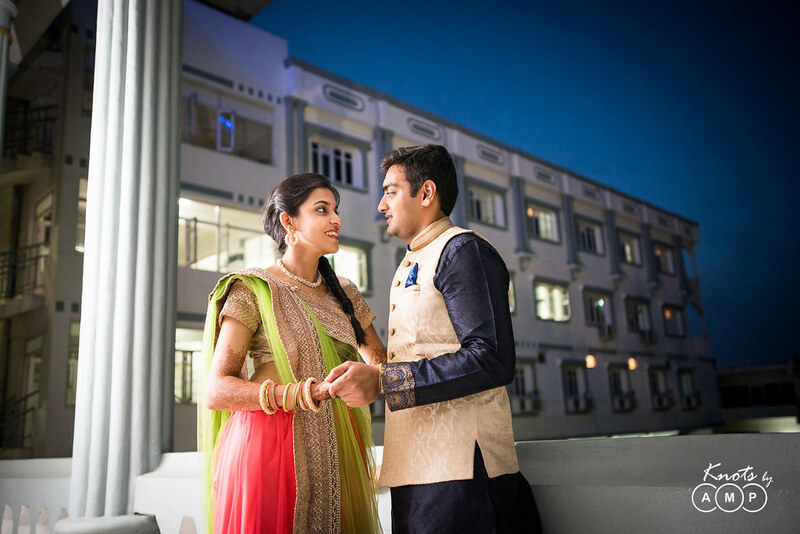 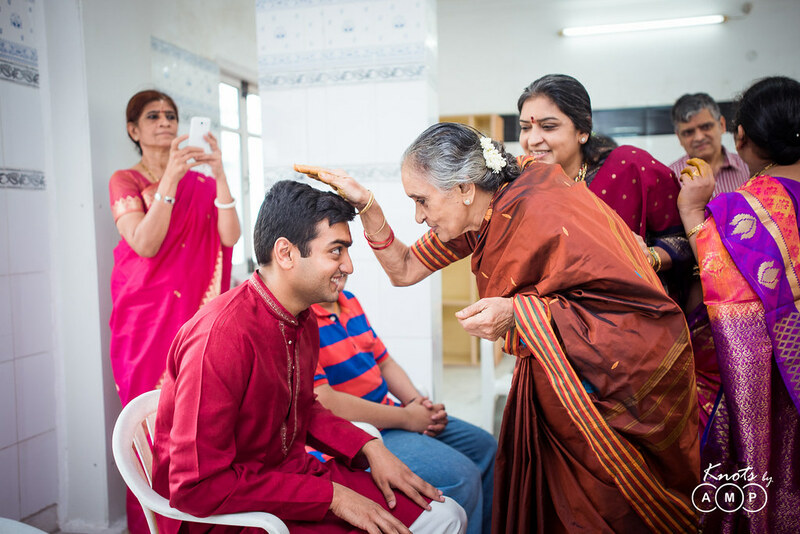 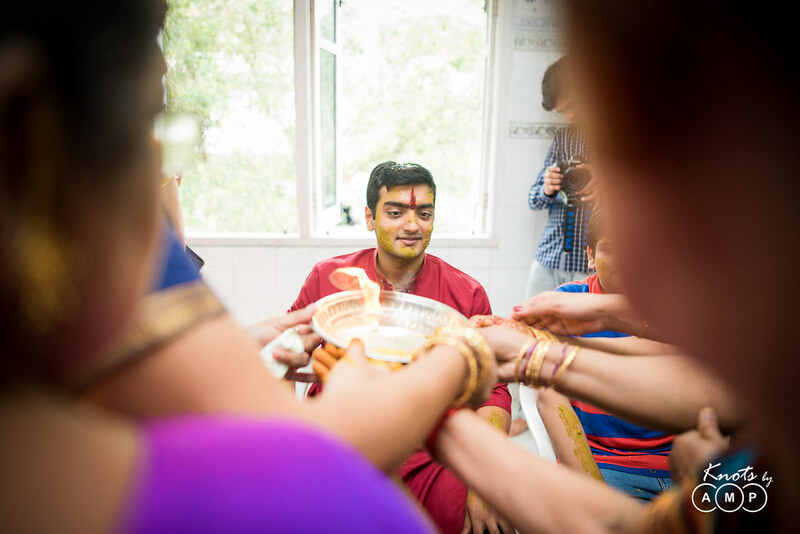 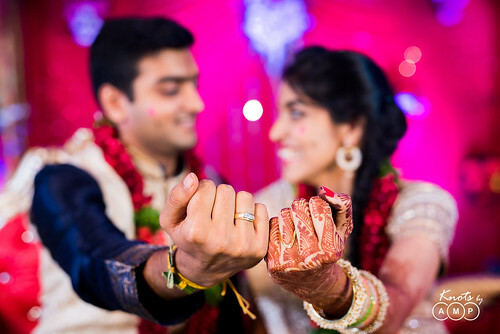 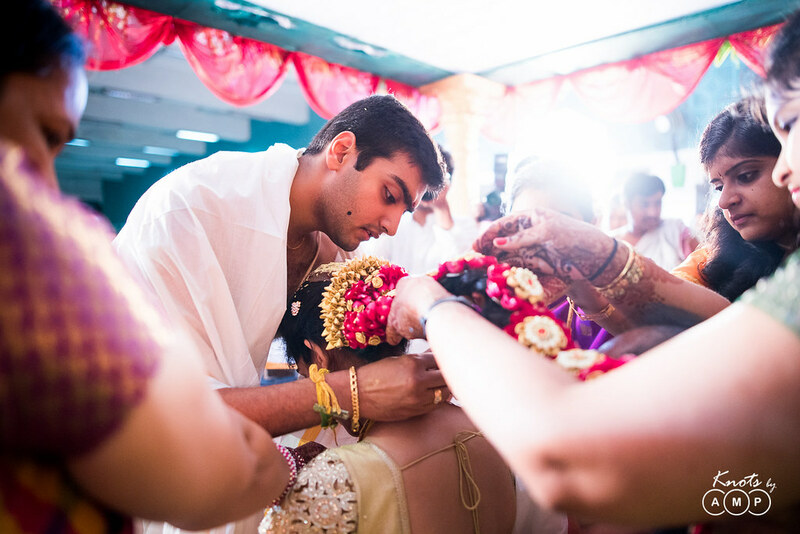 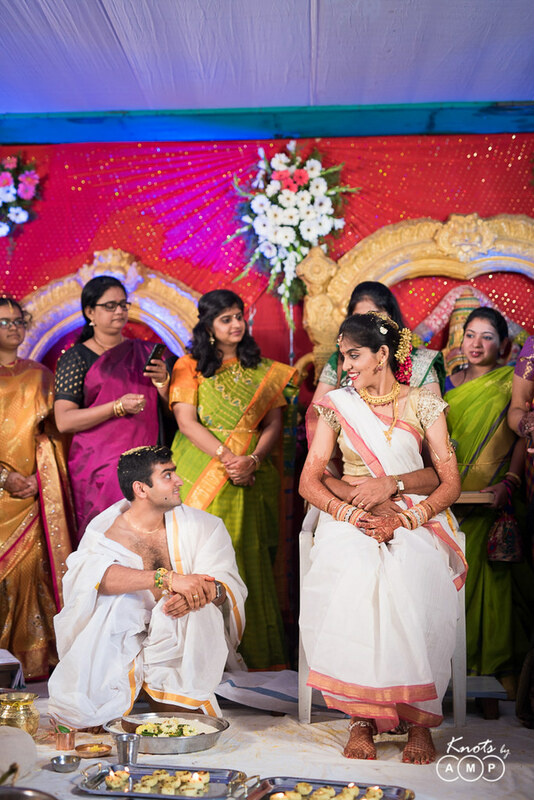 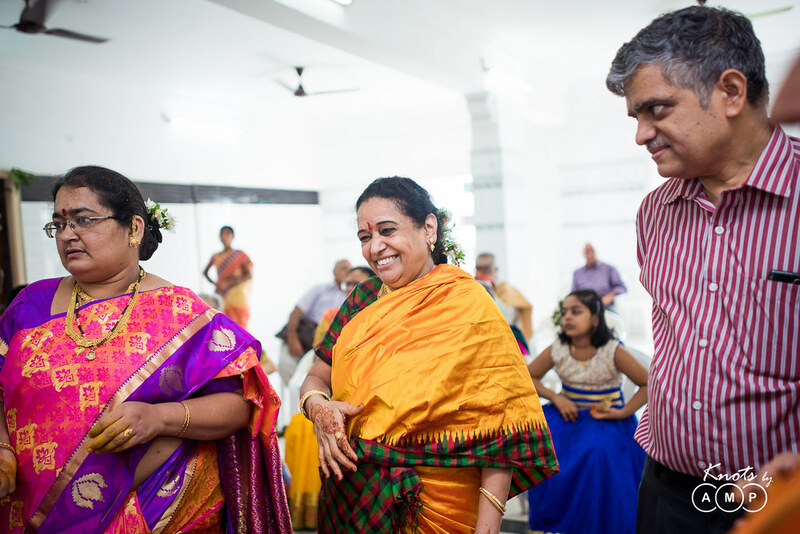 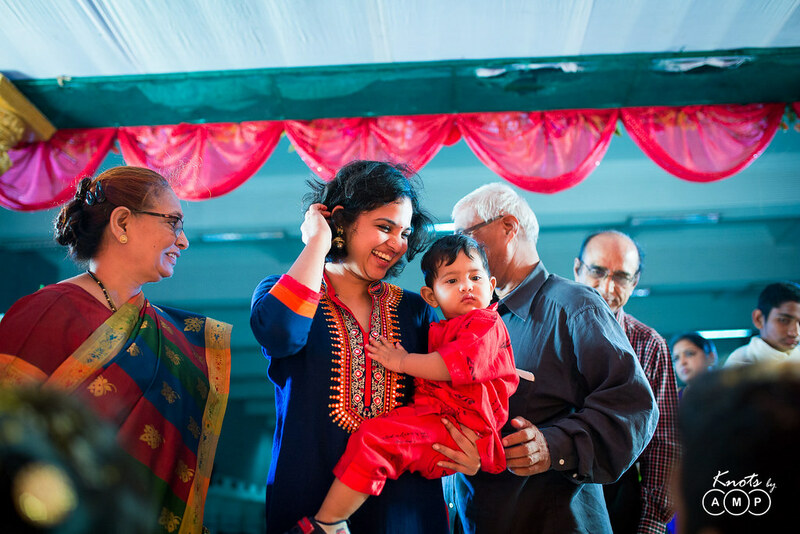 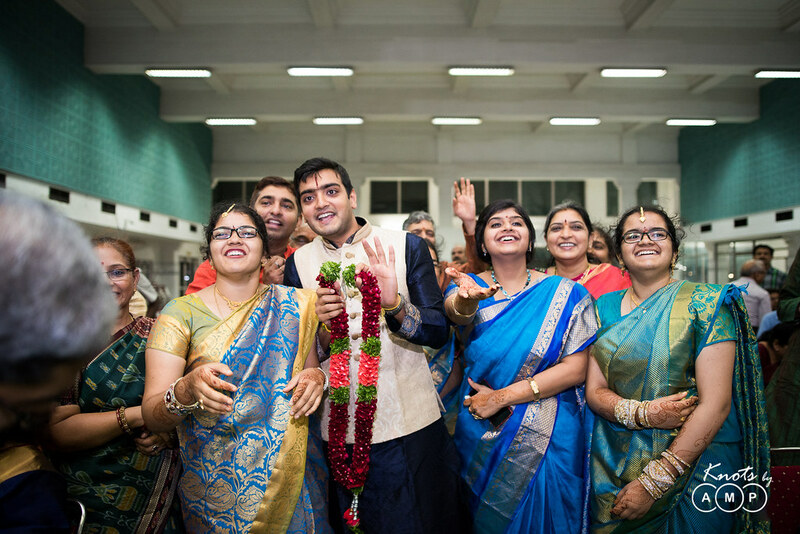 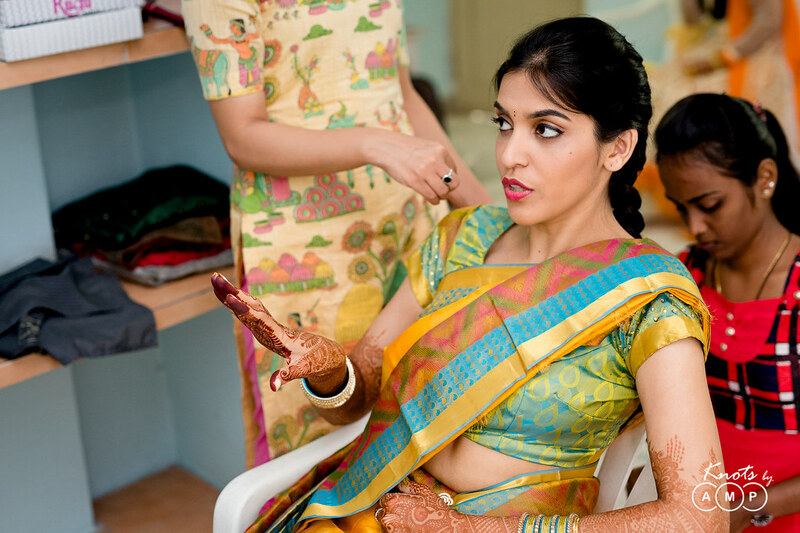 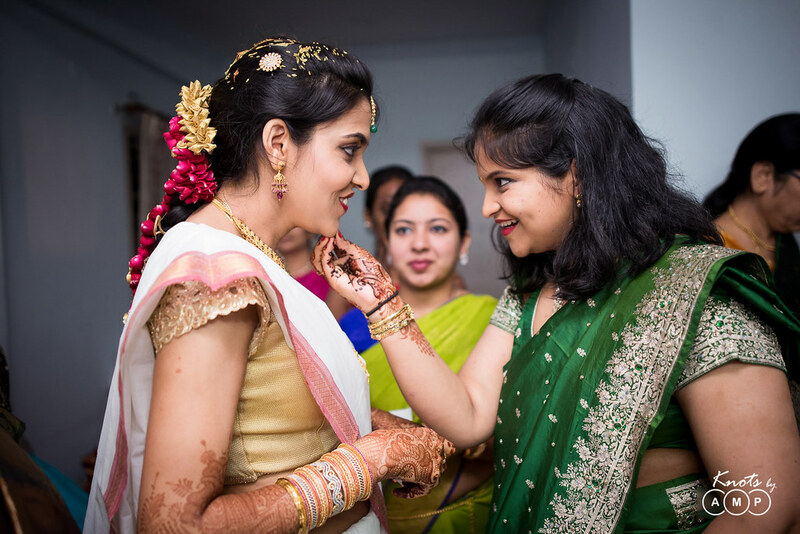 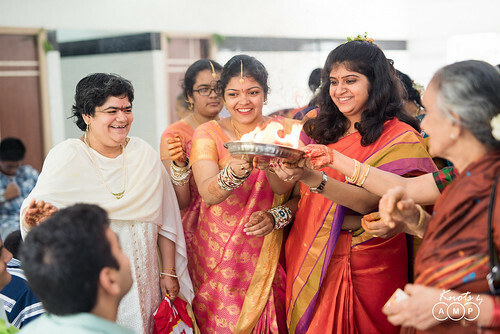 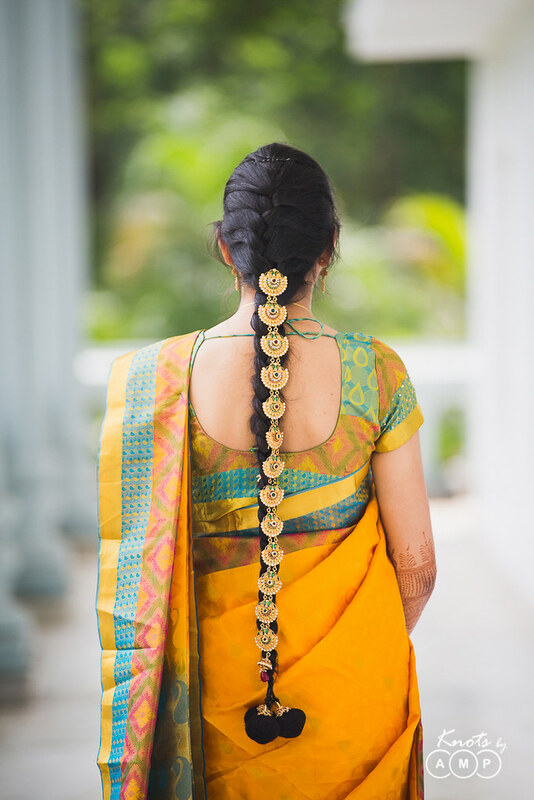 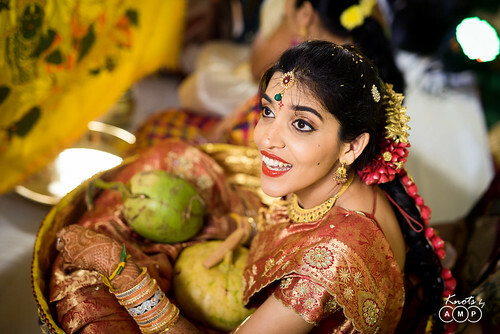 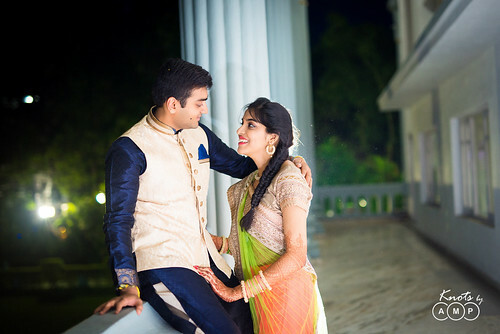 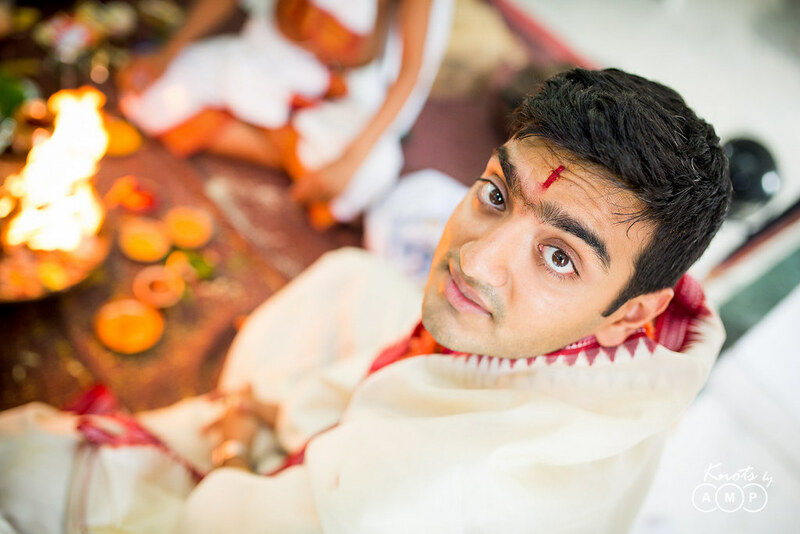 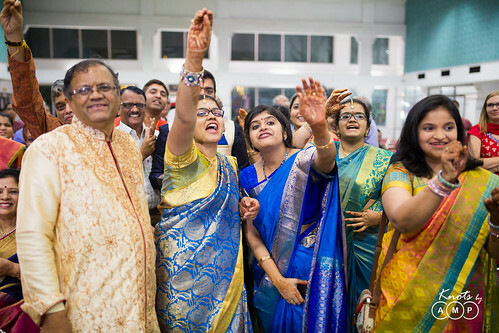 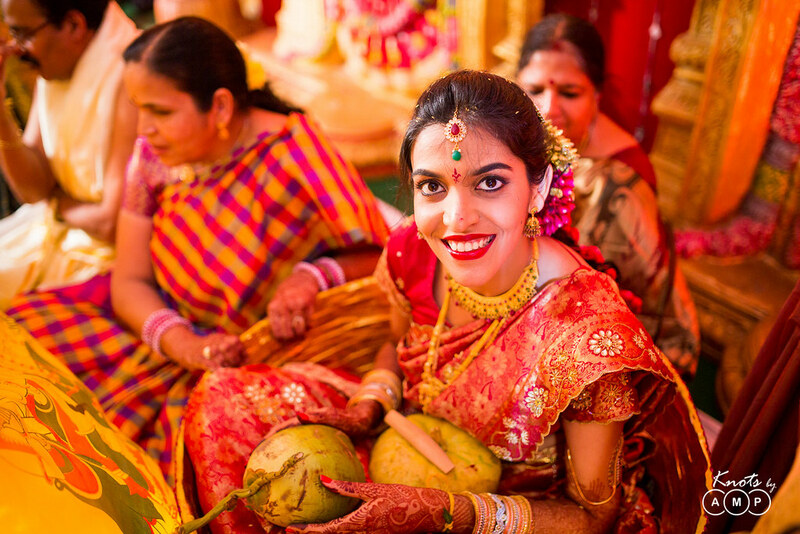 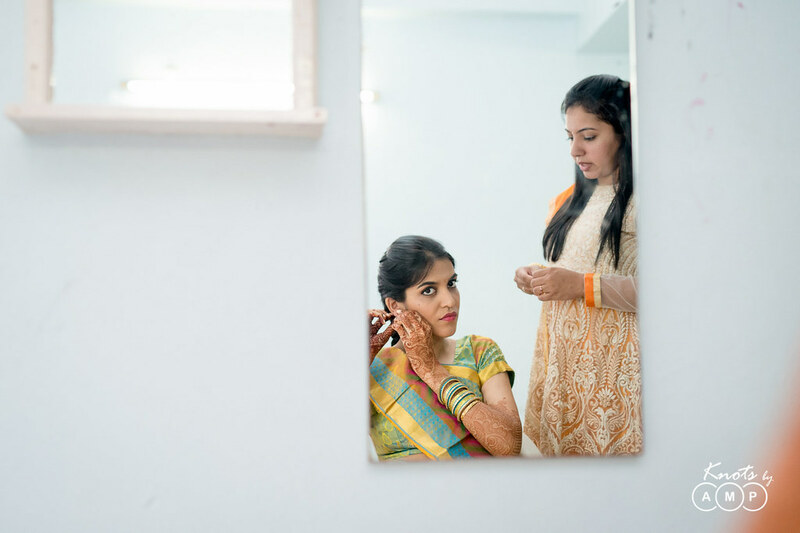 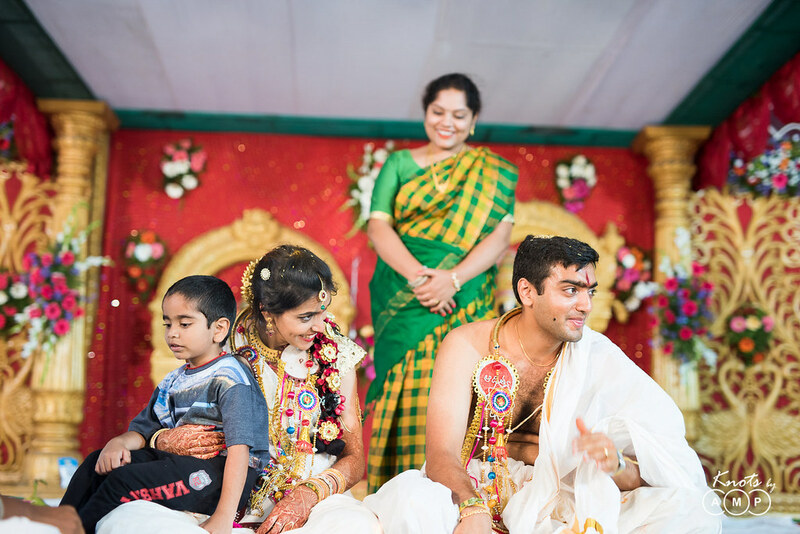 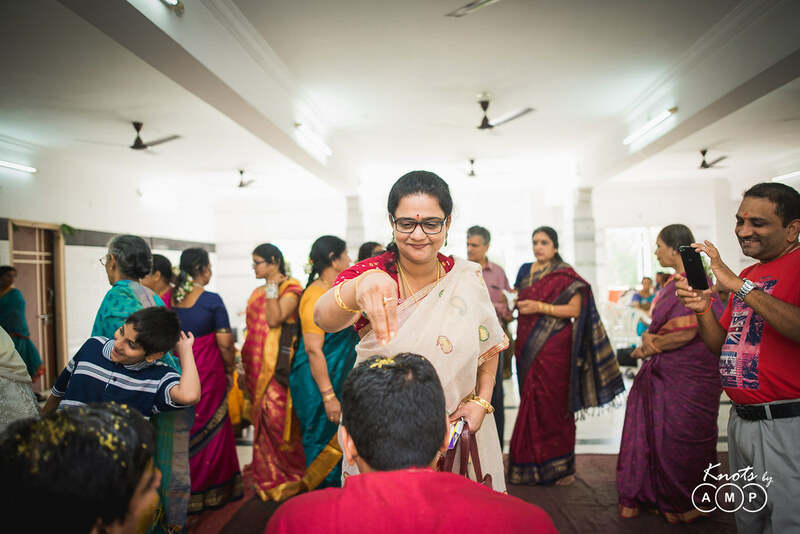 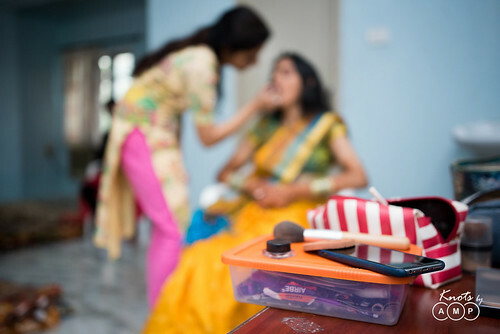 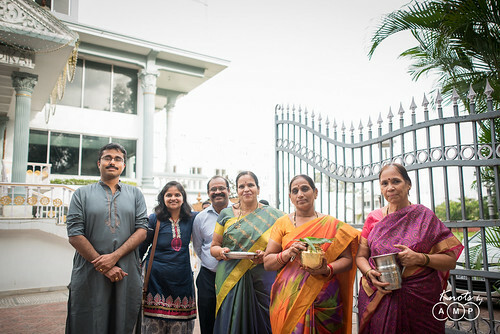 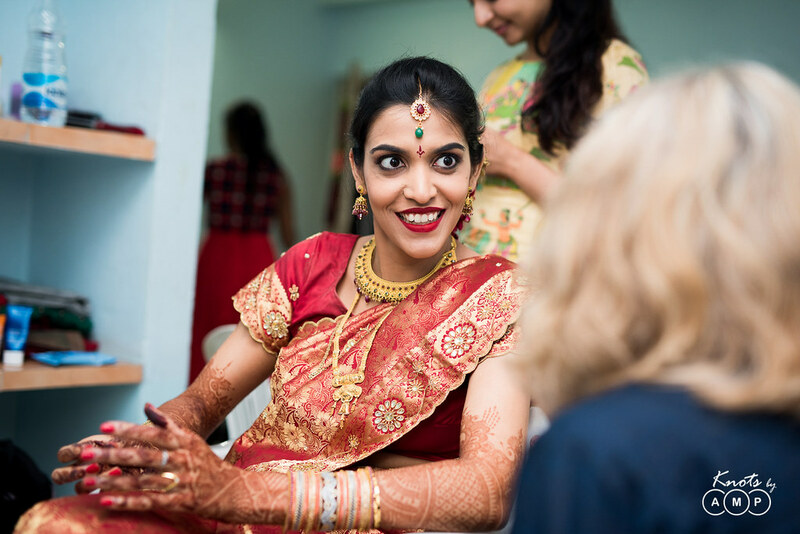 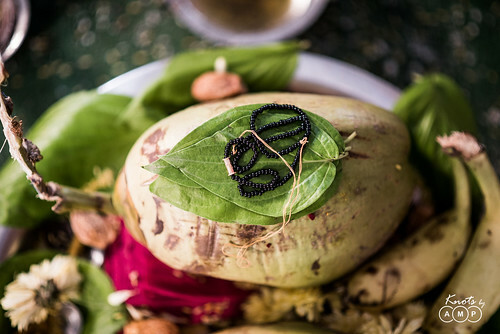 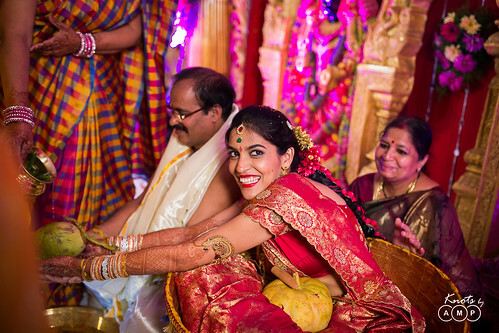 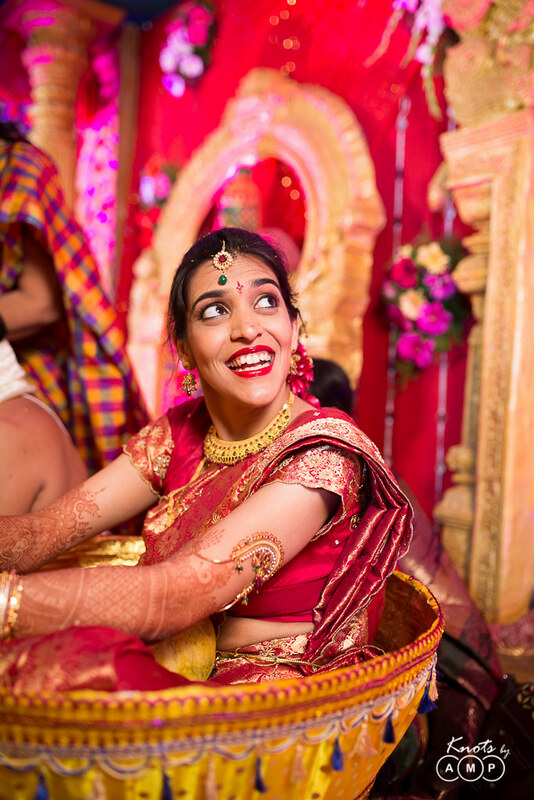 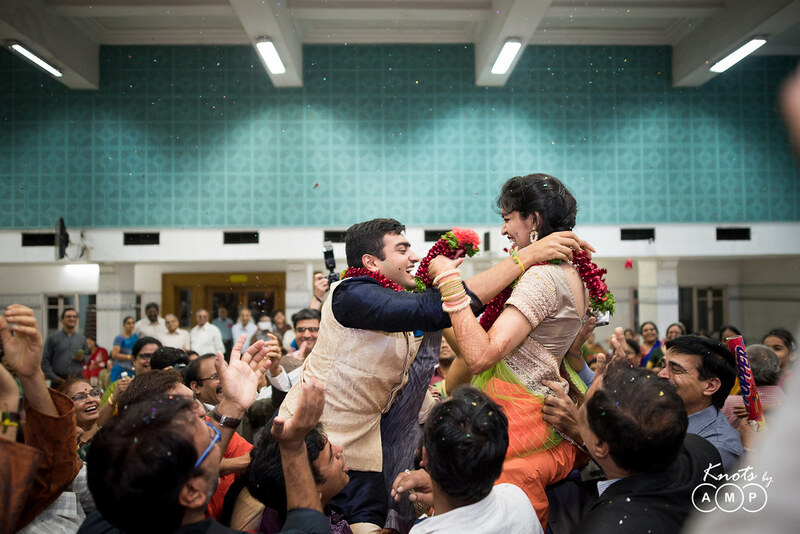 Subsequently we came to know that Sahiti loved our work and our documentary approach to wedding rituals and ceremonies along with blending couple portraiture and capturing fine details. 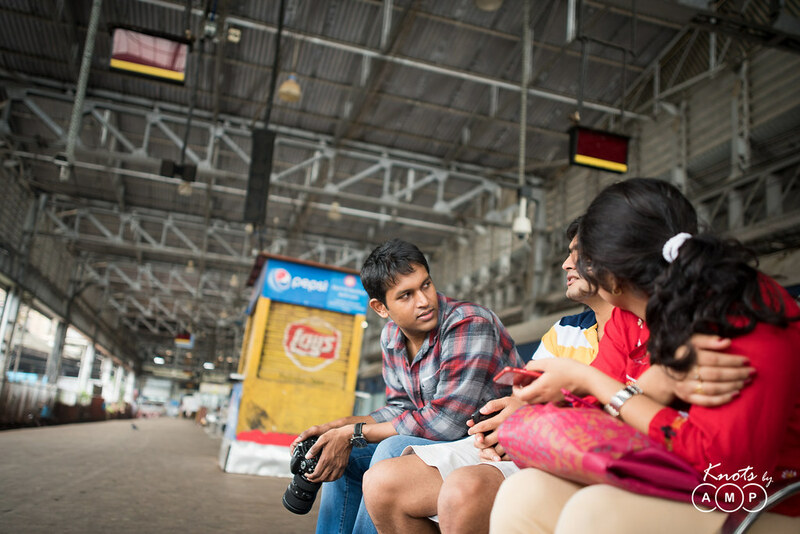 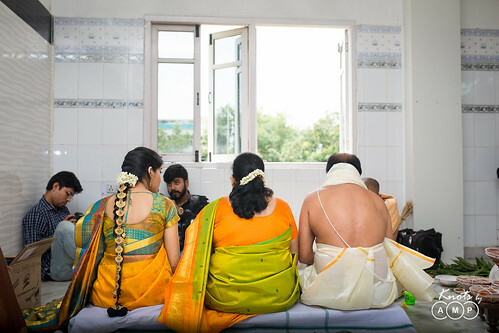 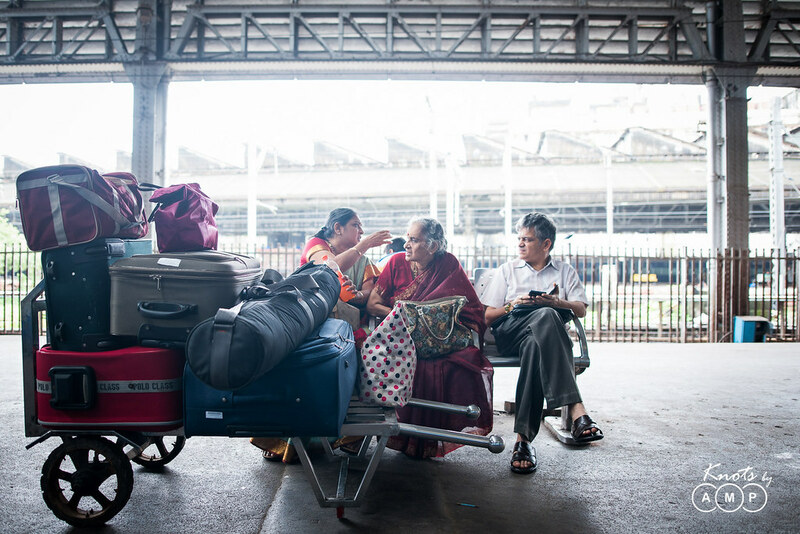 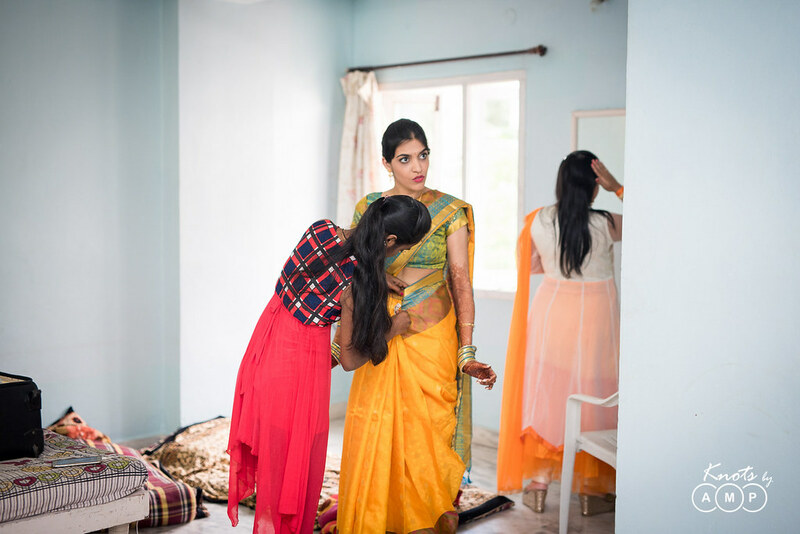 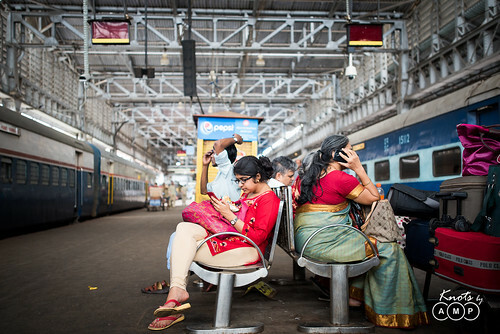 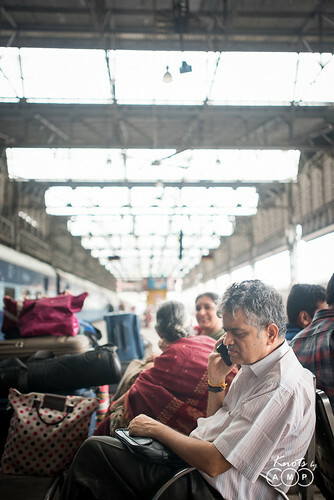 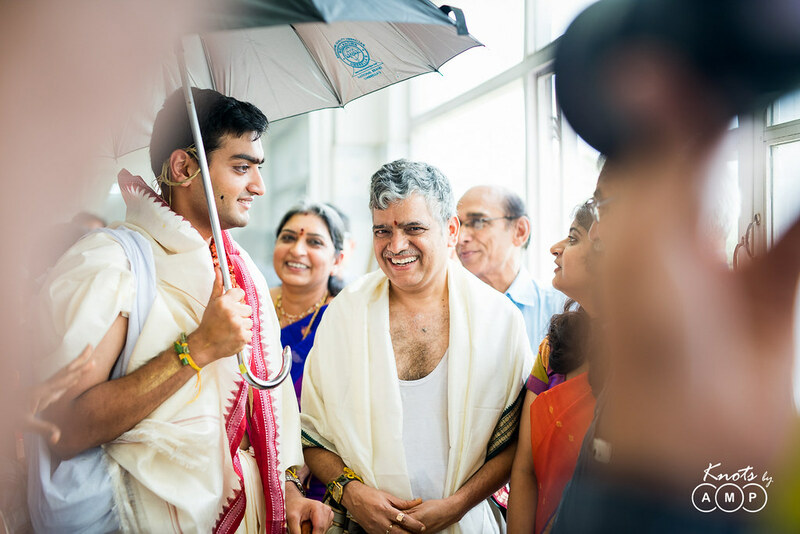 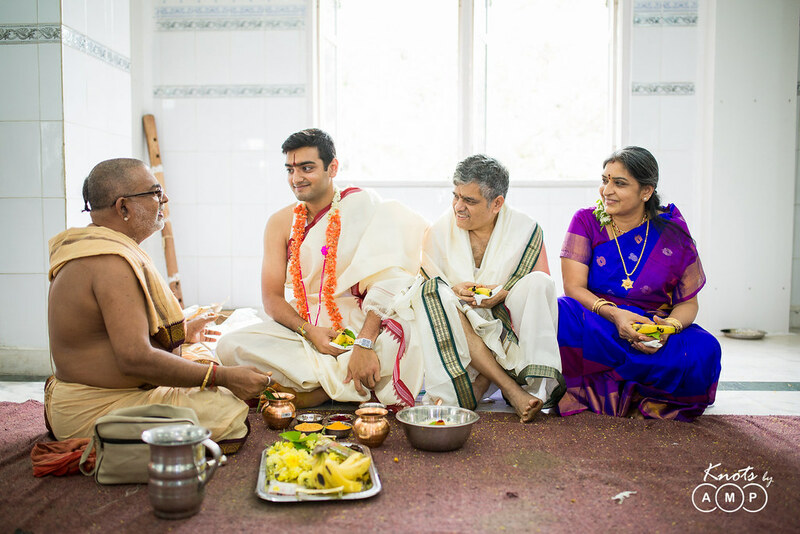 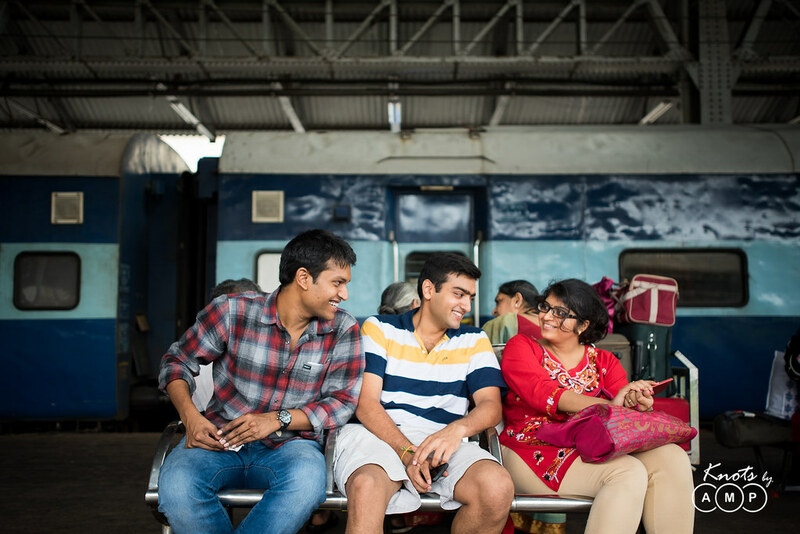 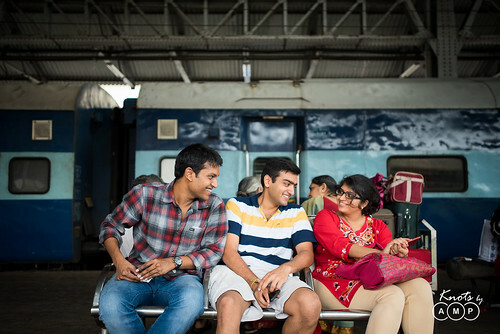 I personally wanted to enjoy Adi’s wedding and not shoot it, but as both of them were keen on us shooting the wedding, we found ourselves travelling to Hyderabad in a train along with Adi’s family. 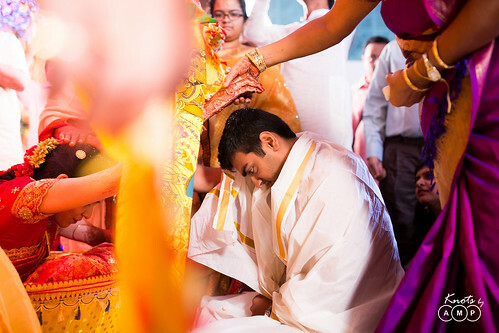 Saptapadi: The bride and groom take seven steps Saptapadi together and with each step they recite one vow. This symbolizes the beginning of their journey through life as partners. 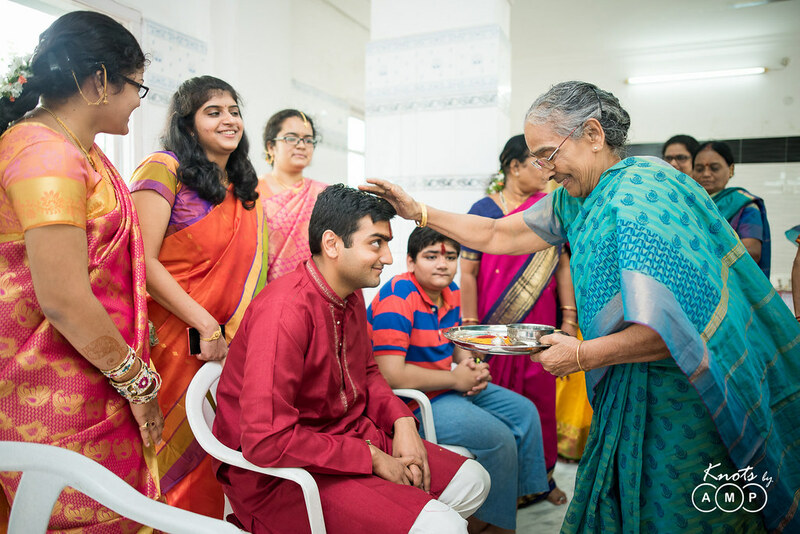 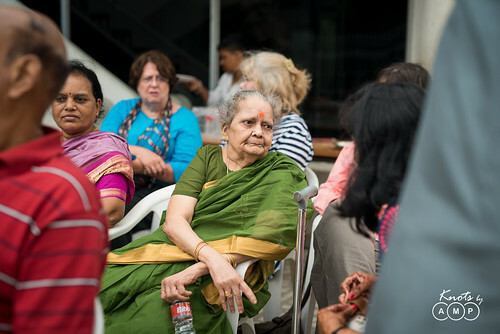 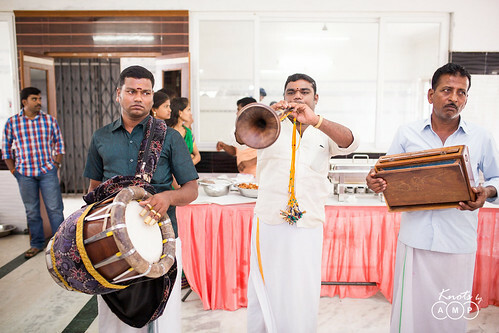 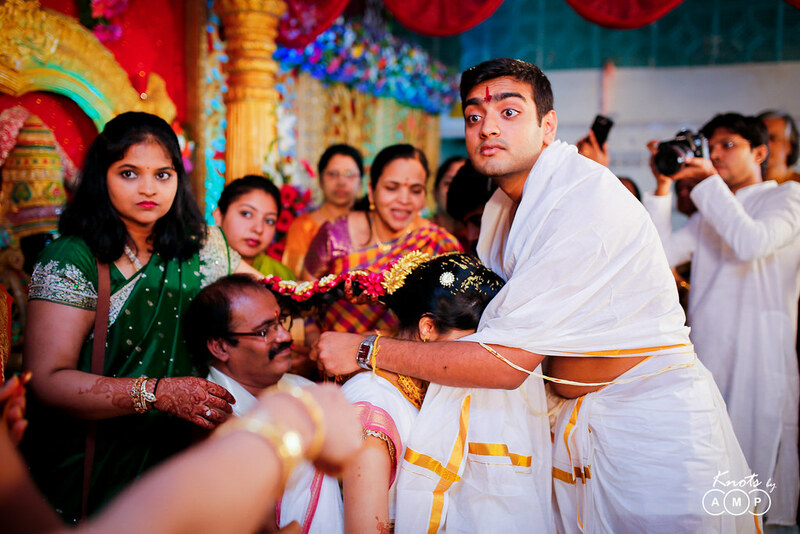 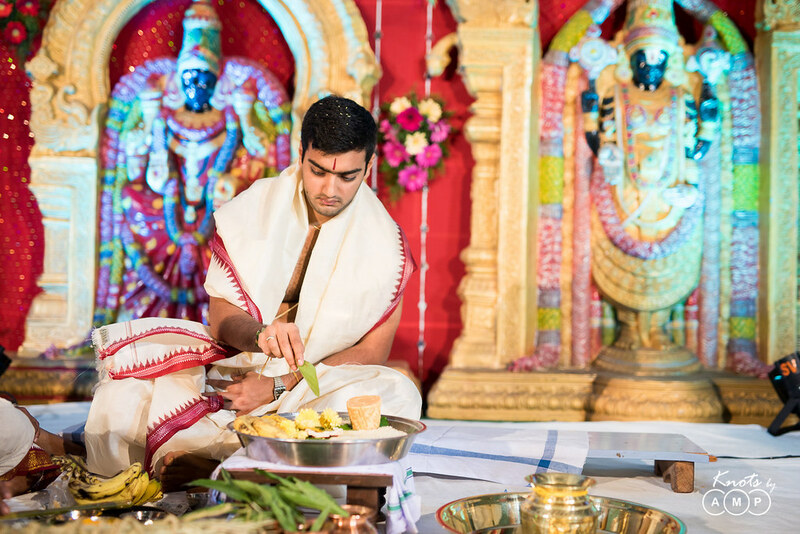 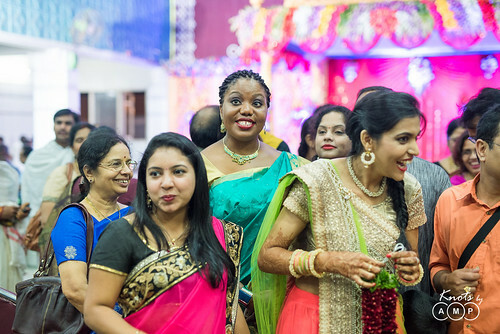 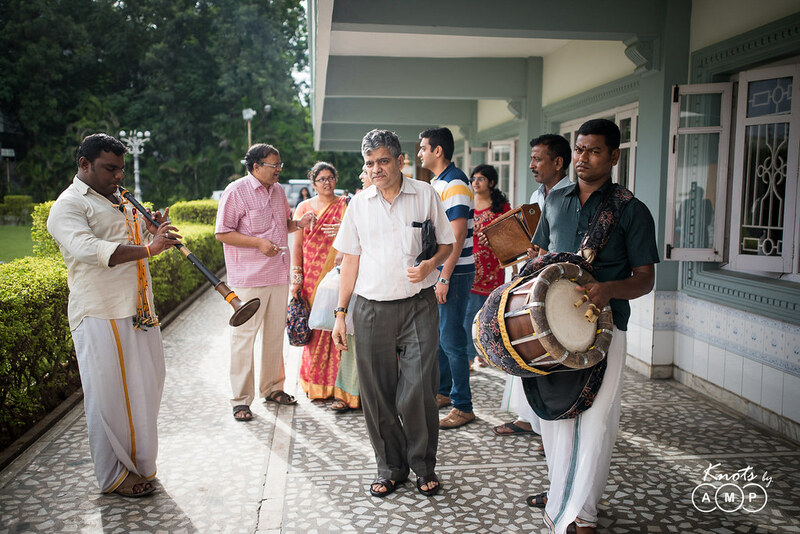 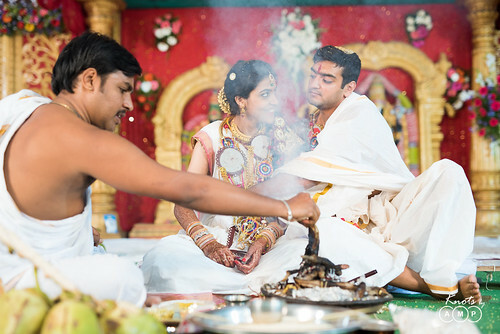 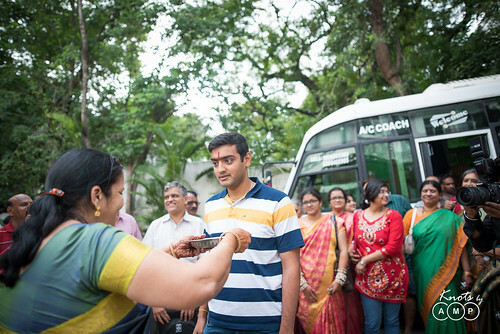 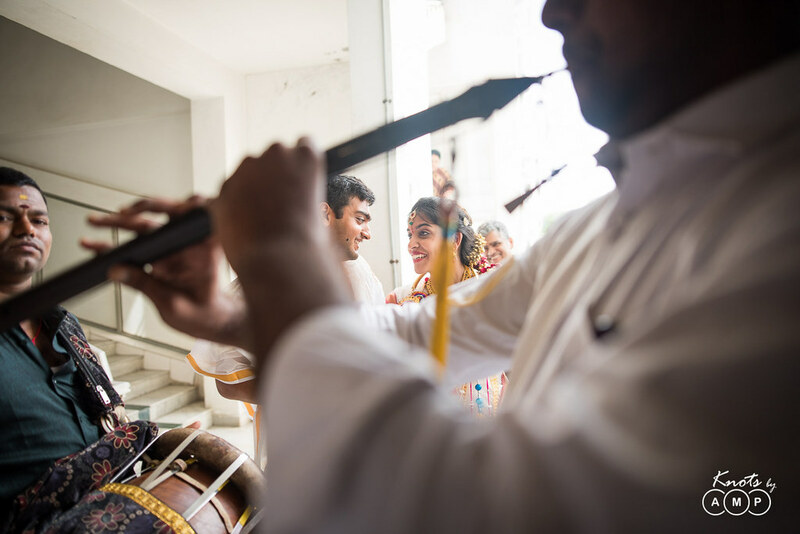 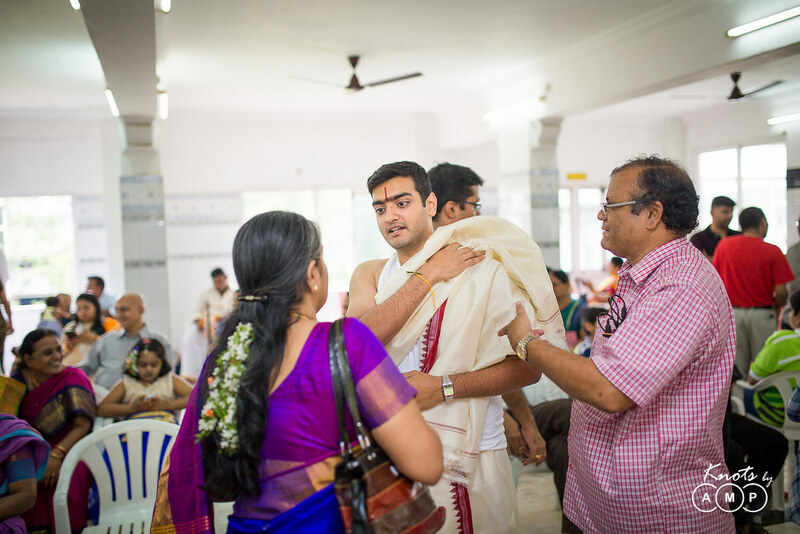 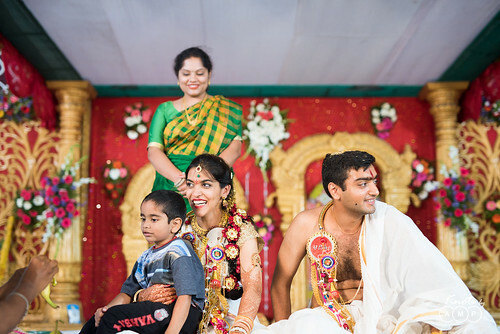 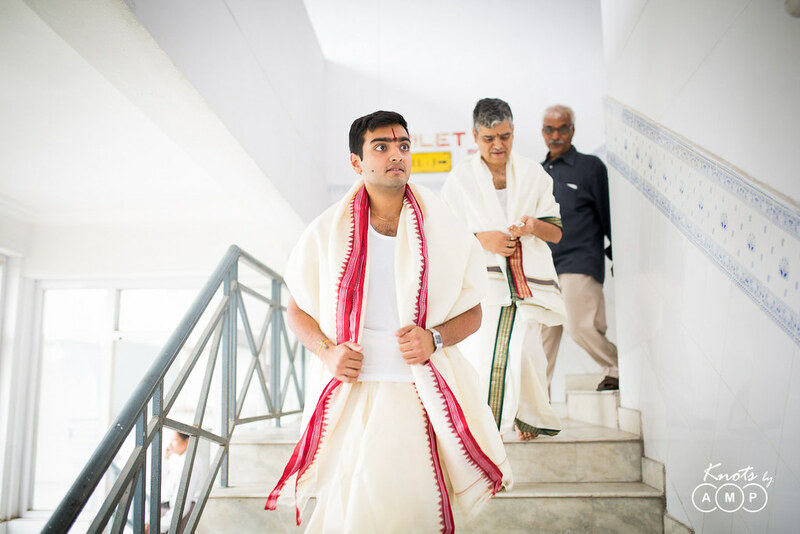 As the muharatam was at 3.30 am in the night by the time the wedding got over it was already morning. After the wedding even though Aditya and Sahiti were completely exhausted they happily shot a lot of fun photographs together. 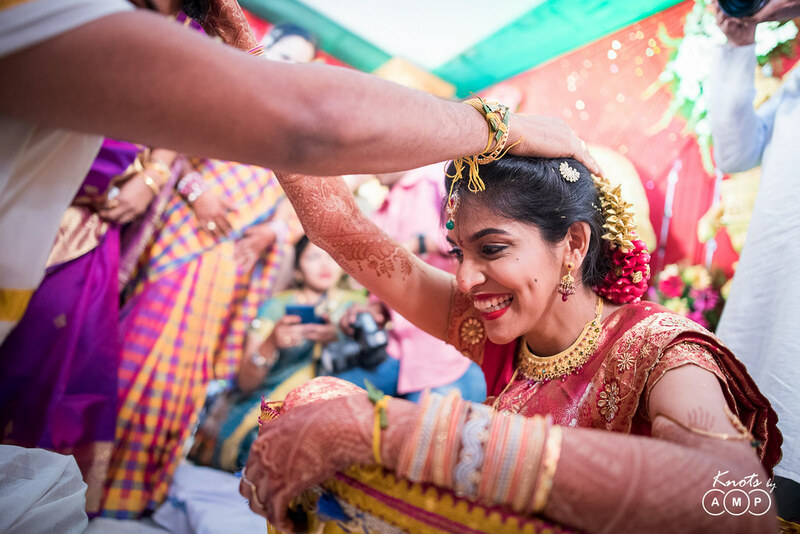 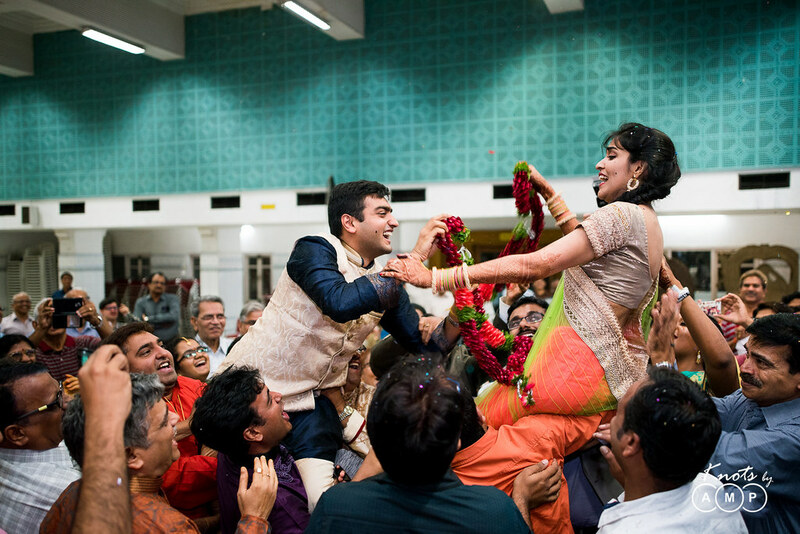 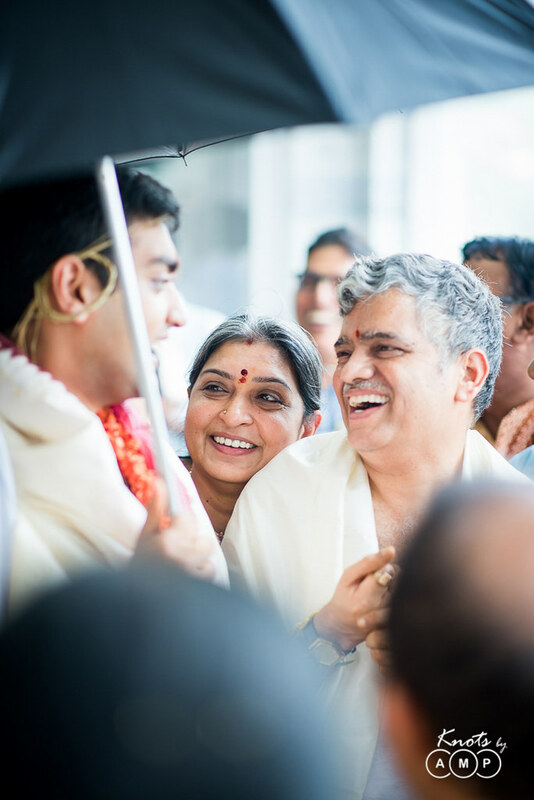 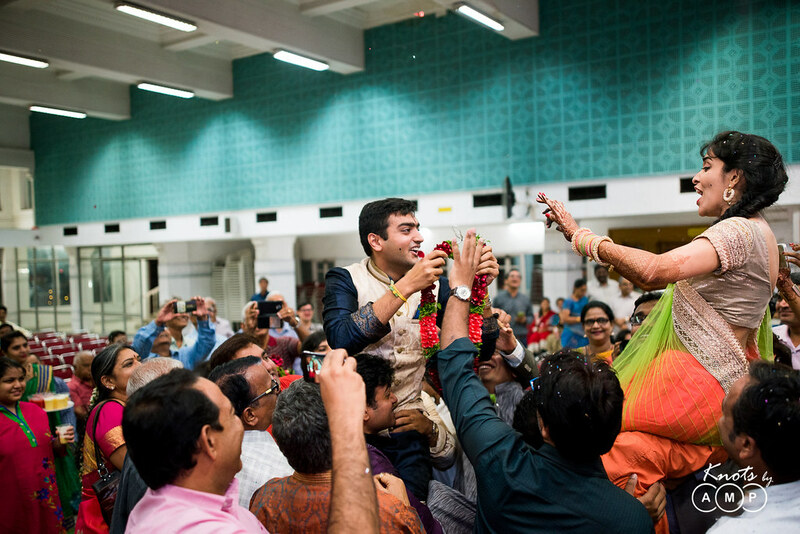 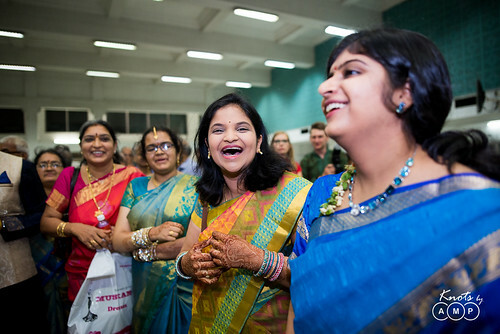 This is one of our finest work in terms of documentary coverage of a wedding and its partially because of the support and love we got from Aditya and Sahiti’s family. 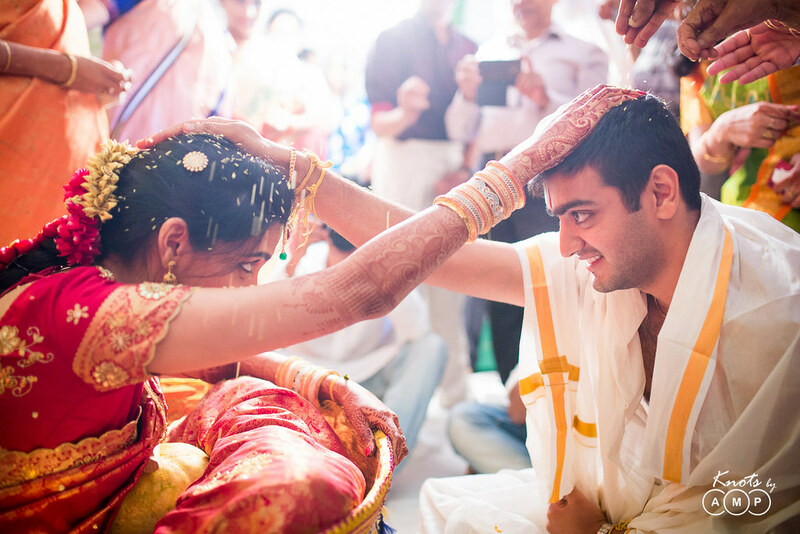 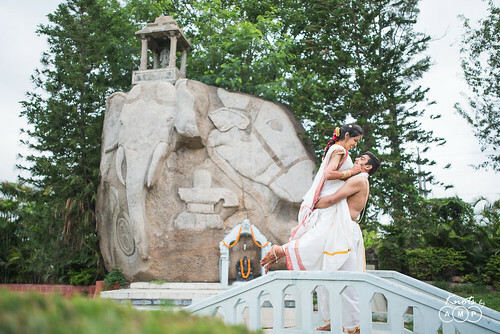 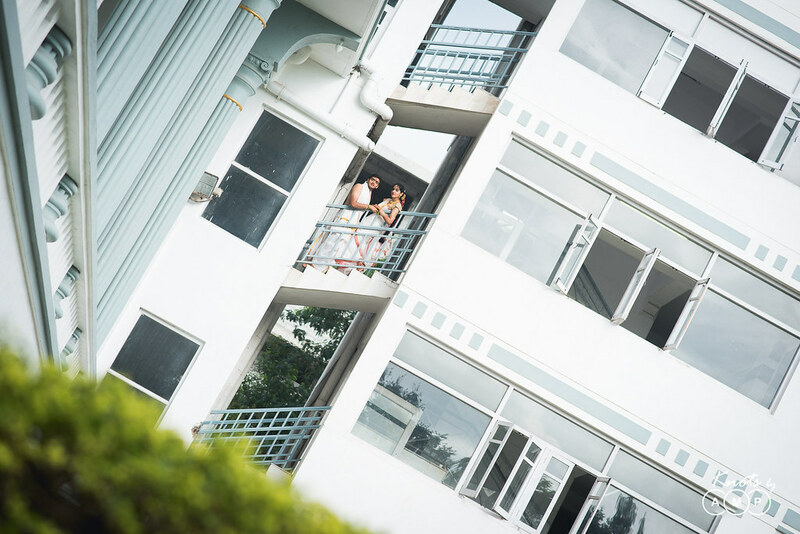 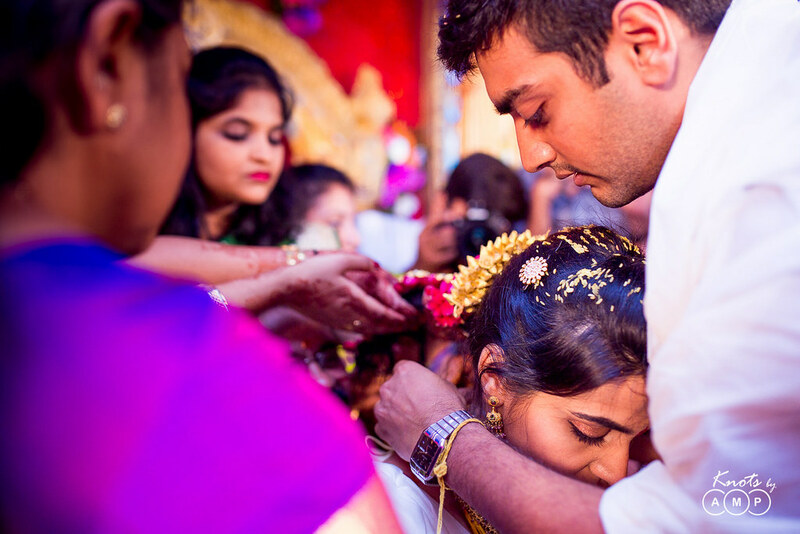 We hope you could see the whole story of their wedding unfold through the photos. 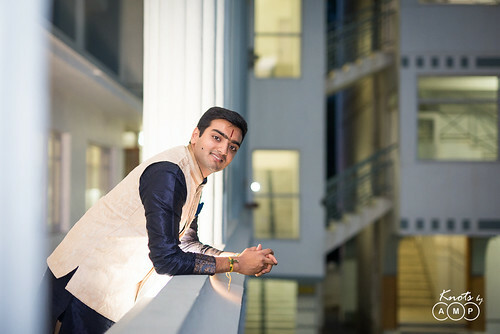 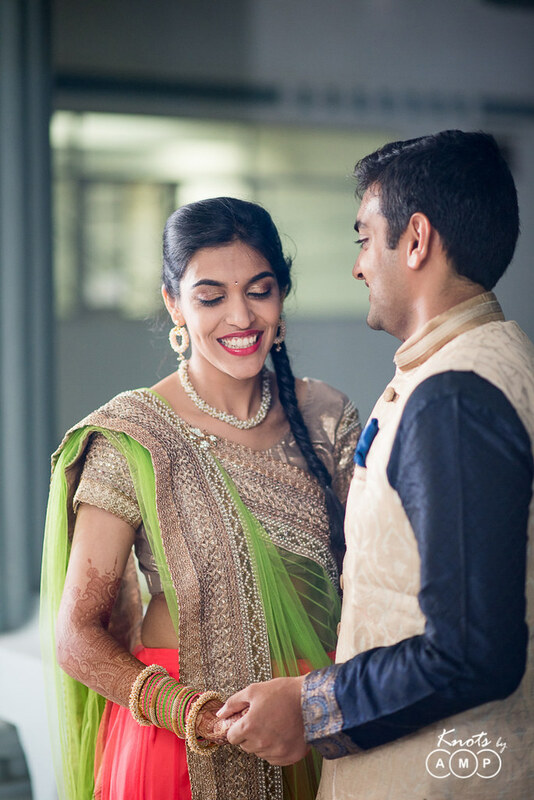 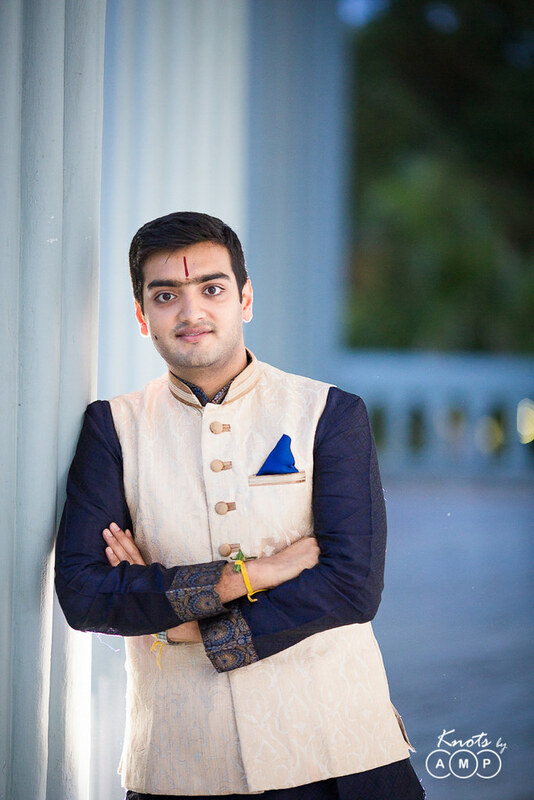 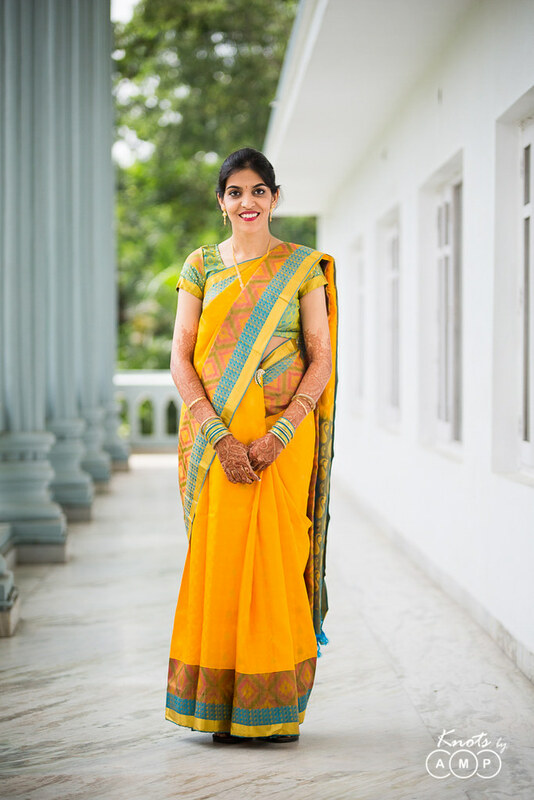 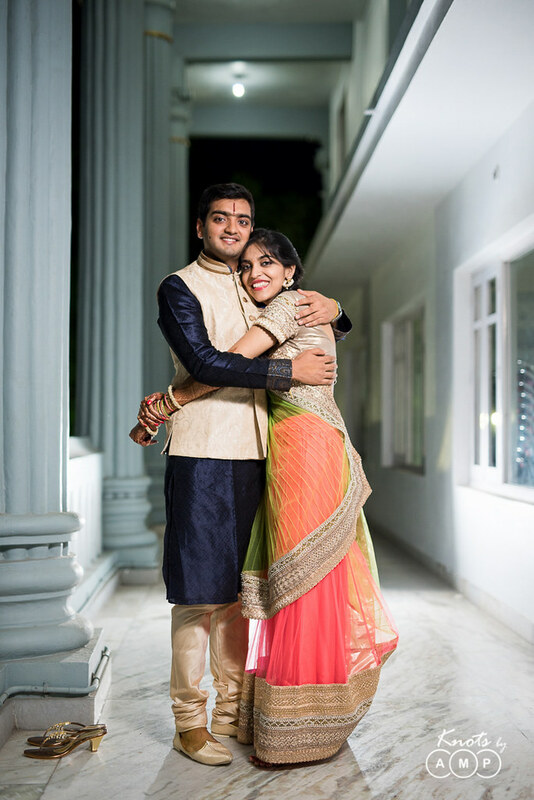 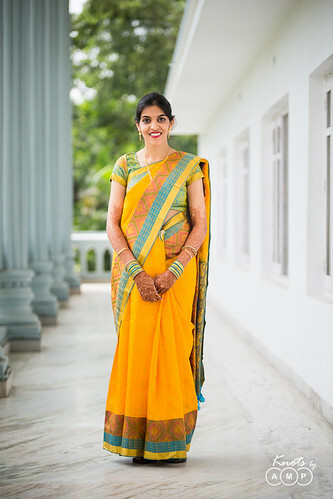 Wedding Couture: As I often get messages from men and women who are interested to know where to shop for wedding clothes, here is where Aditya and Sahiti got their clothes from. 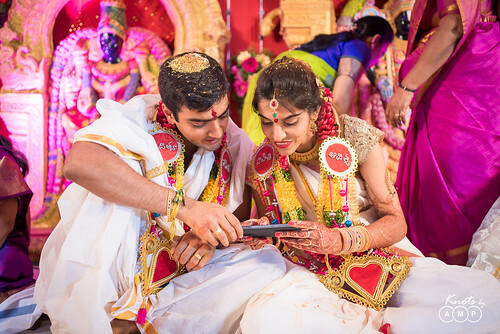 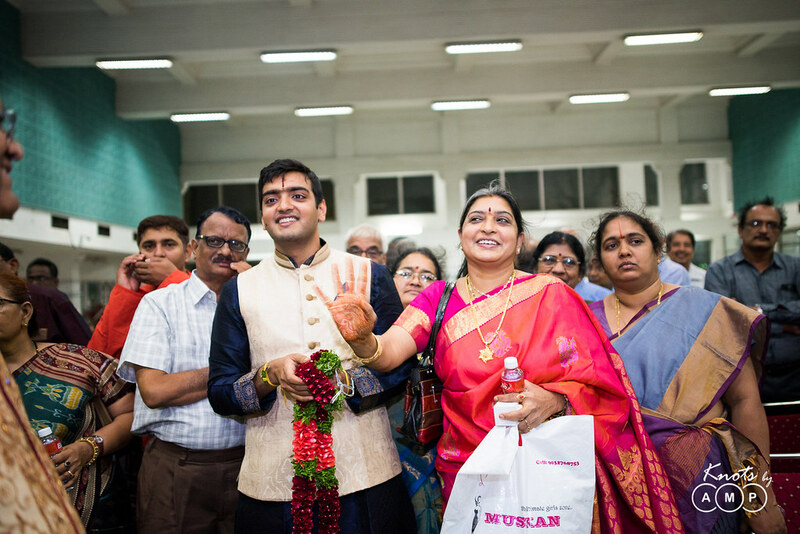 As the bride and groom didn’t have much time they did their wedding shopping in Mumbai and Hyderabad respectively. 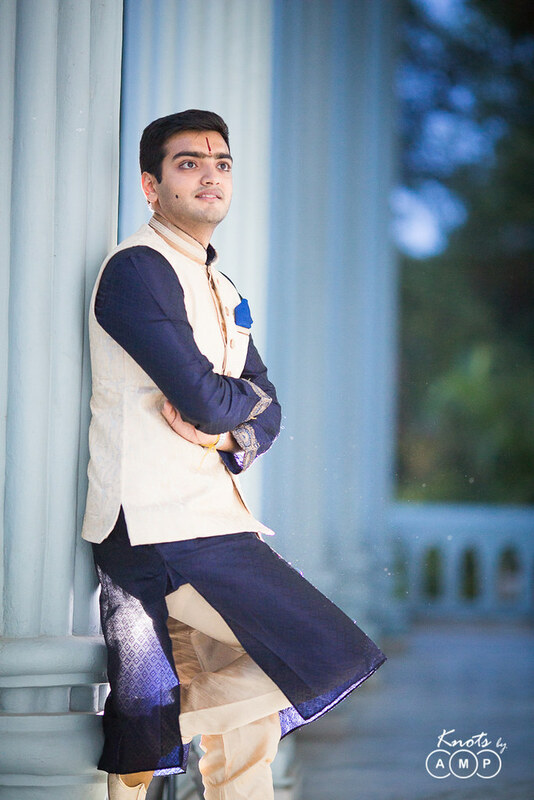 Aditya headed to Santacruz in Mumbai which is the best place to shop for wedding clothes in Mumbai. Having explored most places in Mumbai myself for wedding clothes I would say this is the best place for guys to buy some decent and classy clothes – Manyavar, Jinam, Kora offer amazing collection for Men. Also a lot of designers have their outlets here, so a visit here is must.